Jason provides his list of the top 20 tried-and-true Android smartphone apps that are worth your time to download. The Android Market may not have as many apps as the iPhone App Store yet, but there are still more than enough to be overwhelmed, and it continues to grow at a breakneck pace. To help you sort through them all, here is my latest list of the 20 most useful Android apps (this is an update of my 2010 Android list). I’ve also recently updated my list of the most useful iPhone apps and you’ll notice several of the same apps on both lists. Remember that I primarily had business professionals in mind when making this list and also keep in mind that this is a snapshot in time. The Android platform is developing so quickly that I guarantee my home screen will look different a month from now. Still, here’s my list of tried-and-true Android apps that I can highly recommend. 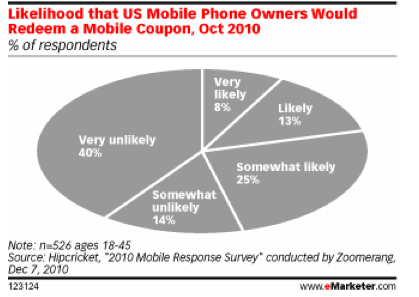 Google Voice is a service that is so useful I consider it one of the top benefits of Android itself. The service gives you a phone number that can ring to multiple places or devices and it allows you to access all of your voicemail and text messages from the Web. The Android app integrates even deeper. It can make outgoing calls look like they’re coming from your Google Voice number so that you can keep your real mobile number private. 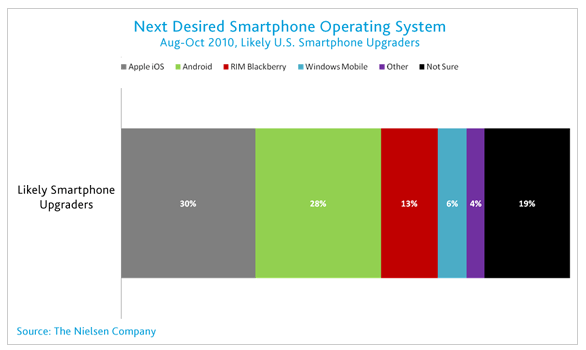 One of the realities of having a multitasking mobile OS is that you have to manage your apps so that they don’t hurt performance or battery life. Advanced Task Killer (ATK) is my favorite on Android. It even comes with a widget that you can tap once to kill all open apps and you can also set up ATK to kill all apps at periodic intervals. Some people will argue that task managers are irrelevant and unneeded in Android, but I still prefer to use ATK. Dropbox is a great cloud service that automatically syncs a folder of files between multiple computers (Windows, Mac, or Linux). This app extends Dropbox to Android and interacts with other apps (such as Documents To Go) to open the files. It allows you to access PDFs, image files, and business documents by simply dragging them to a folder on your computer and then you immediately have access to them from your mobile phone, once you have this app installed. Once you get used to typing on a virtual keyboard (and it honestly took me over a year to do it), then these devices are great for note-taking, and Evernote is a great note-taking app. It is similar to Dropbox in that it saves data locally but syncs it across all your machines and devices. There are plenty of to-do apps to choose from on Android but I now prefer Taskos because of the clean, easy, Android-friendly user experience. 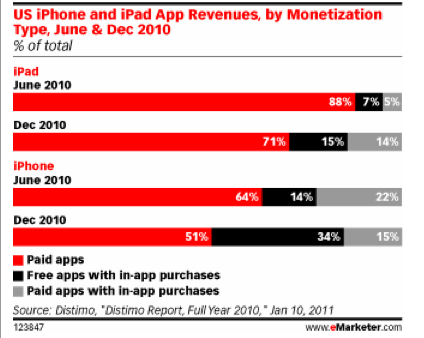 It also has a few extras that give it an advantage over apps. The biggest one is voice recognition, which lets you speak a task that the app turns into a to-do item (you might have to correct a word or two). For some reason Google doesn’t have an official app for Google Analytics (for either Android or iPhone). 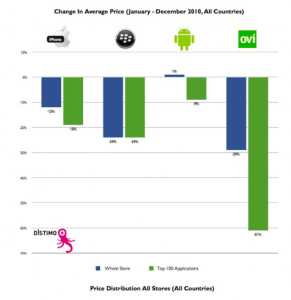 The best one I’ve found on Android is DroidAnalytics. 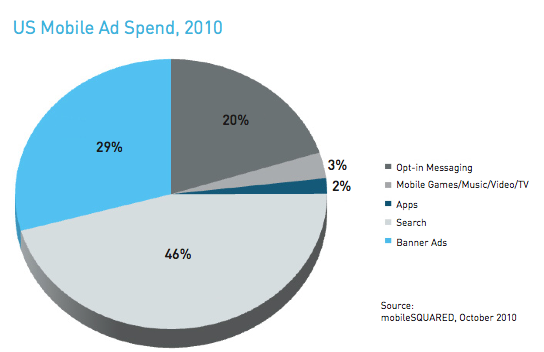 Another good one is mAnalytics. The free version of Documents To Go offers a great little reader for Microsof Word and Excel files. You can upgrade to the full version (for $15) if you want to be able to create and edit files and add PowerPoint files to the mix. If you do want editing capability, I’d also recommend taking a look atQuickOffice. If you mostly work with Google Docs (including uploading Microsoft Office files to your Google Docs repository) then the only app you’ll really need is the Google Docs app. It’s a nice mobile implementation of document management, although the one annoyance is that always open up files in a web browser rather than within the app itself, which would be a little smoother. I dig Tripit. It is by far the best app I’ve found for keeping track of all my travel itineraries. It runs on some great backend systems. You simply forward your confirmation emails for your flights, hotels, rental cars, and more to Tripit and it automatically organizes them into trips with all your details and confirmation numbers. Or, if you use Gmail, you can even use a plugin to automatically catch confirmation emails and turn them into Tripit trips. This is an awesome app for finding shops and services near your current location. From restaurants to medical facilities to taxis, this app is very accurate and takes advantage of the business information from Google Local. This app is better than the info you get from a GPS unit (or app) and better than any of the similar apps available on the iPhone. It’s also integrated into Google Maps. Another one of the great things about Android (if you’re a geek or a tinkerer) is that you have lower-level access to the system itself. Astro is an app that lets you navigate the Android file system, which is mostly just interesting, but can be handy once in a while. I’m obsessed with running speed tests to check my bandwidth in various places, both to see 3G/4G fluctuations and to check the quality of Wi-Fi. There are a number of really good speed test apps, but my favorite is the Speedtest.net app. 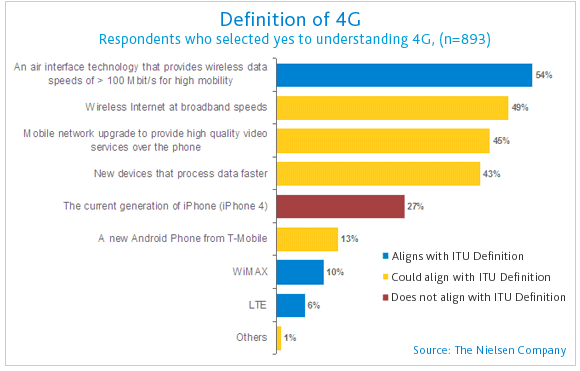 It’s generally consistent and it has some of the best graphics and options. 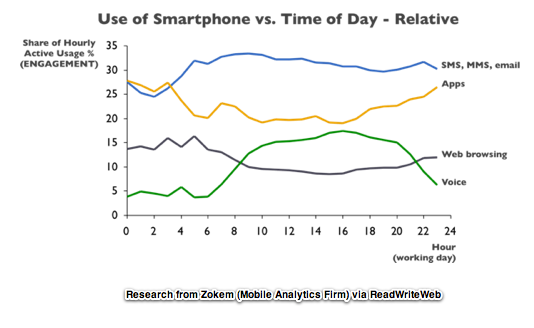 I’ve never completely warmed up to the Amazon Kindle e-reader, but I’m a big fan of the Kindle mobile app. Since it was released I’ve read a lot more books simply because my smartphone is always with me and I can pull it out and read a few pages anytime I’ve got a couple minutes free. 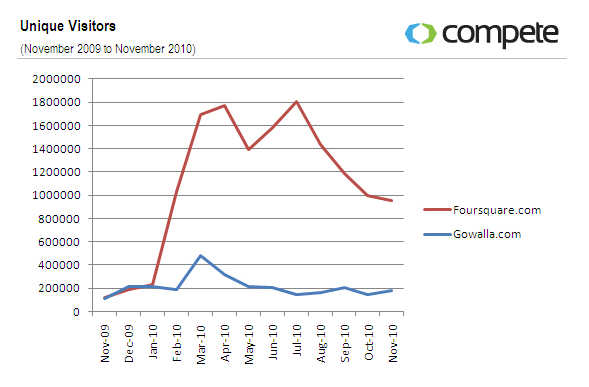 I’ve written a lot about Google+ since it launched in July and I’m pretty active over there (+emkaytsg). One of the great things that Google did was to release a Google+ Android app at the same time it launched the service as a beta. 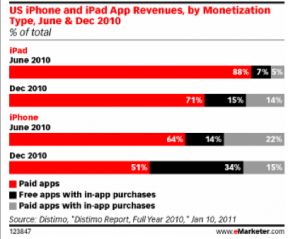 And, surprisingly, the app was actually pretty good and has been improved since. It immediately became one of my most used mobile apps and definitely stole some of my time away from Android’s Twitter app, mostly because Google+ is a little more interactive. The TED conference features a meeting of the minds of some of society’s most influential thinkers. You’ll disagree with some of them since there’s a large diversity of viewpoints, but many talks are worth listening to in order to catch the latest creative thinking on society’s biggest challenges. The cool thing is that they’ve taken the videos from the conference and made them freely available on the Web. 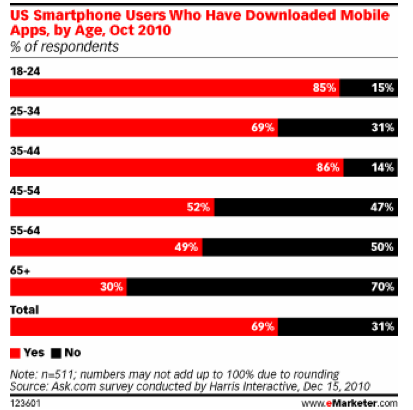 The TED Air app provides a great way to access the videos on a mobile device. I hope more conferences follow TED’s lead on this. This is a fun app that is a little bit ahead of its time. It does visual searches. You can take pictures of things and then the app tries to tell you what they are. It’s limited in its scope but it is pretty cool, and it’s definitely a peek into the future. One of the coolest features is the ability to take pictures of text in a foreign language and let the app translate it for you. In a foreign country, this can help you read street signs and avoid going into the wrong bathroom. 🙂 On a more practical level, Goggles is a QR code reader. 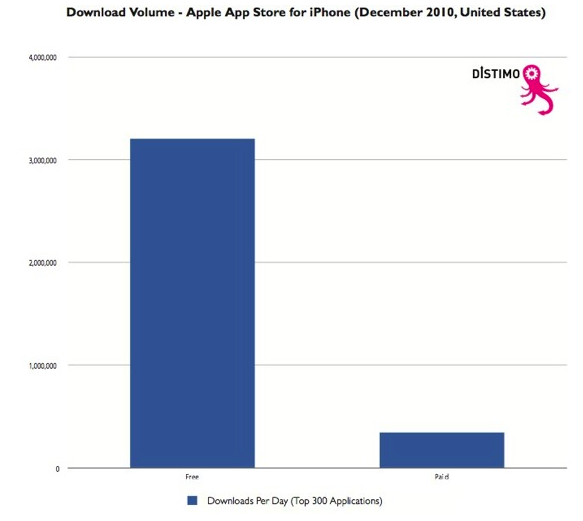 Photoshop is, of course, the best known photo editor in the world and its mobile app doesn’t do anything to hurt that reputation. 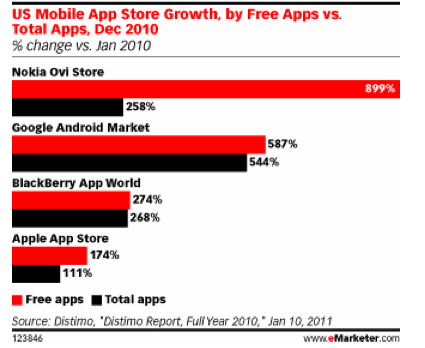 But while the desktop version is known for having a zillion features, the mobile app is distinguished by its simplicity. It’s the best Android (and iPhone) photo editing app for simple crops, brightness adjustments, and sharpens, for example. 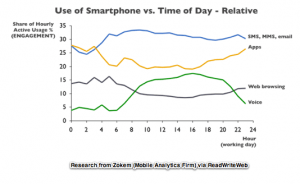 As much as I like the Kindle ebooks, I actually consume more books as audiobooks via Audible. With the Audible app you can connect to your Audible library and download over the air. The app also gives you a self-contained player optimized for audiobooks, with a skip-back-30-seconds button and the opportunity to make notes and bookmarks (although I wish the app would store these online so that they could be accessed from the Audible site). This is a great little app that regularly gets overlooked. It connects to your Google Finance account, where you can set up a list of stocks and companies to follow and sort them into groups (portfolios). 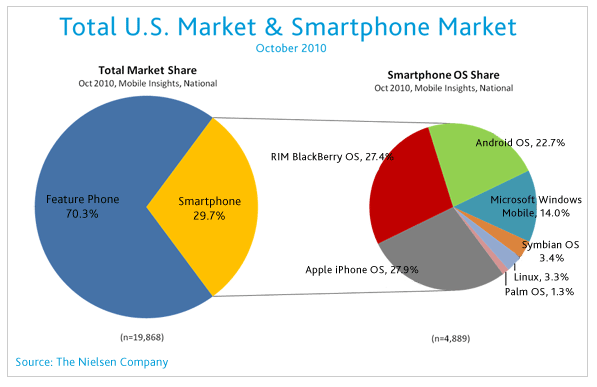 The app provides three simple tabs — a look at the market, a look at your portfolios, and the latest market news. It even does real-time updates when you have the app open. Other Non google APS which are very good. KeePass for Passwords. Save password file in DropBox and will be automatically synced to desktop, etc. KeePass is OpenSource. WhitePages-free version – driving around town and need to look up a restaurant number – use WP’s. Can then add the number/business to contacts. 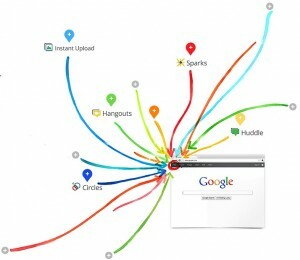 Google Reader – sync with Google Reader, RSS feeds, etc. Dolphin browser because I like tabbed browsing. . .
Droid Light – who doesn’t need a flashlight now and then? 2X client – great, free Terminal services client. Add if you wish any . Does your organization struggle with the problem of properly fitting people to jobs? Here is a handy hint for ensuring success in job placement. Take the prospective employees you are trying to place and put them in a room with only a table and two chairs. Leave them alone for two hours, without any instruction. At the end of that time, go back and see what they are doing. If they have taken the table apart in that time, put them in Engineering. If they are counting the butts in the ashtray, assign them to Finance. If they are screaming and waving their arms, send them off to Manufacturing. If they are talking to the chairs, Personnel is a good spot for them. If they are writing up the experience, send them to Tech Pubs. If they don’t even look up when you enter the room, assign them to Security. If they try to tell you it’s not as bad as it looks, send them to Marketing. If they’ve left early, put them in Sales. And if they’re all bullying each other, they’re Management material. 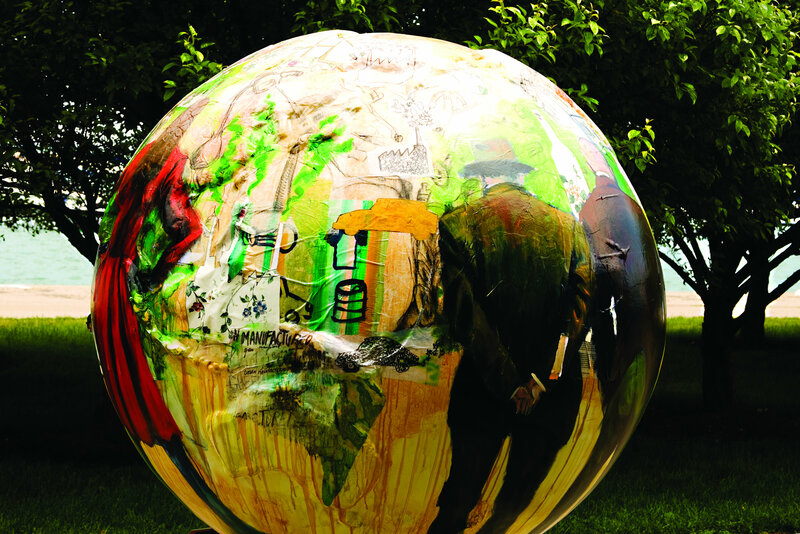 GLOBES´` exhibition, is on display till September 25th. 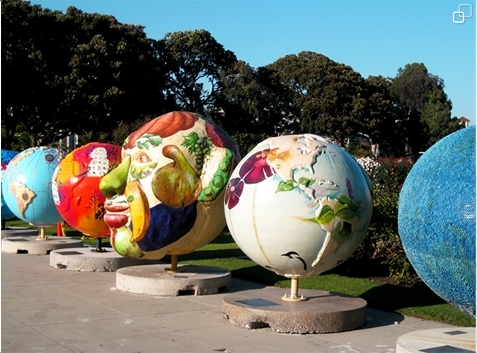 Featured are more than fifty globes, decorated by Dutch and international artists. 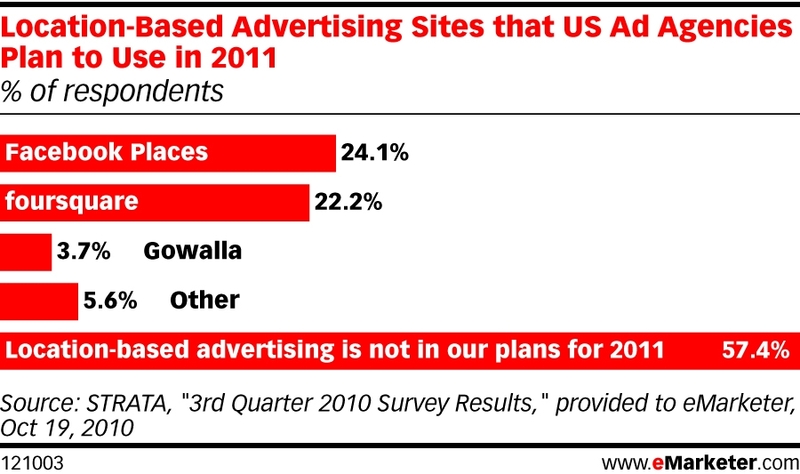 More than half of American households own a computer and more than half of the U.S. workforce uses one. 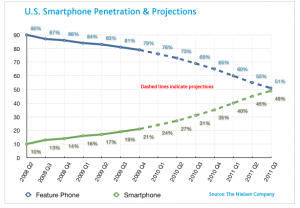 There will soon be one television for every U.S. citizen. These electronics account for up to three percent of the nation’s electricity consumption. Energy-efficient models of computers, monitors and televisions are available and should always be unplugged when not in use. 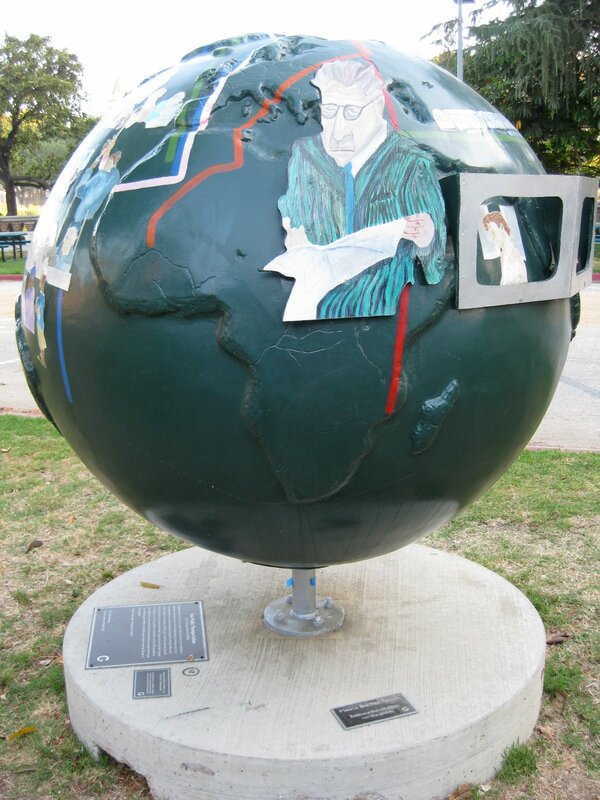 Colors indicate the imminent threat of global warming on Robert Chambers’ globe. Green landmasses symbolize the potential for change – the more green a continent contains, the more environmentally aware its inhabitants are. Red masses are the most vulnerable, indicating the need to speed up our green process. Chambers also mounted solar-powered cooling fans within the oceans to demonstrate the possibility of such devices to hypercharge bacteria to gobble up pollutants in seawater and produce a by-product of sustainable energy. When roofs are made of dark-colored materials, more heat is absorbed into the building and, consequently, more air conditioning is necessary to keep the inside cool. A cluster of dark roofs actually increases a city’s air temperature, creating a “heat island.” In urban areas or warm climates, homeowners should choose a “cool roof” that reflects the sun. Reflective roofing materials can reduce the surface temperature of a roof by as much as 100 degrees, cooling whole cities and making attics up to 30 degrees cooler. Combining art with the practice of making scientific concepts into hands-on projects, Alice Sharie Revelski created a planet full of “cool roofs.” The mosaic shapes covering the continents are made of roof shingles that reflect UV rays and make roofs energy efficient. The silver oceans dazzle the eye, showing how beautiful, and healthy, the planet will be with more cool roofs. We all know the power of ocean waves. But how many of us know these waves are a viable source of renewable energy? Harnessing the power of the ocean’s water can generate electricity, and this resource has great potential for us now and in the future. The ever-presence of waves allows countries with large coastlines and strong winds to produce five percent or more of their electricity from wave power. One application of this “wave” technology is the Pelamis Wave Energy Converter. The converter, a series of semi-submerged cylinders hinged together, uses the motion of the water to create electricity. Wave farms consisting of three Pelamis machines in the same area have the potential to displace more than 6,000 tons of carbon dioxide emissions that would otherwise be produced by conventional power plants. So catch a wave—and convert it into energy! Urban greening invites city dwellers to spend more time outdoors, planting greenery that helps absorb harmful greenhouse gases. Throughout the city, more and more pavement is being replaced with trees and flowerbeds. Rooftops and vacant lots are being converted into gardens and parks. Approximately 500,000 trees have been planted on median strips alone. Volunteering is an easy way for urbanites to get involved in greening their city and help change the color of the world. Originally from South Korea, Kim Massey grew up in a city surrounded by mountains. 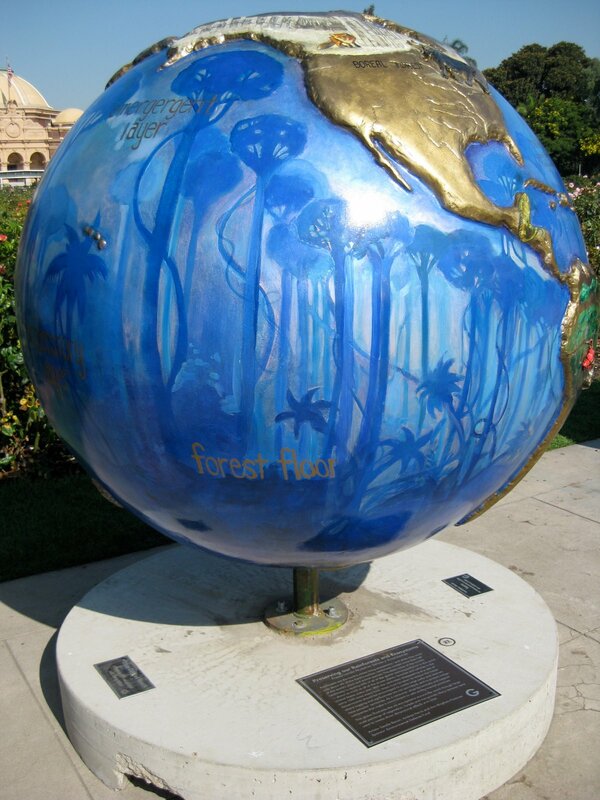 Her globe includes a large sculpted Tree of Life, illustrated for all seasons, growing out of the earth, providing a powerful picture of the vital role trees play in absorbing greenhouse gases, producing oxygen, and shading and cooling the earth. Recycling conserves resources and cuts down on energy use. 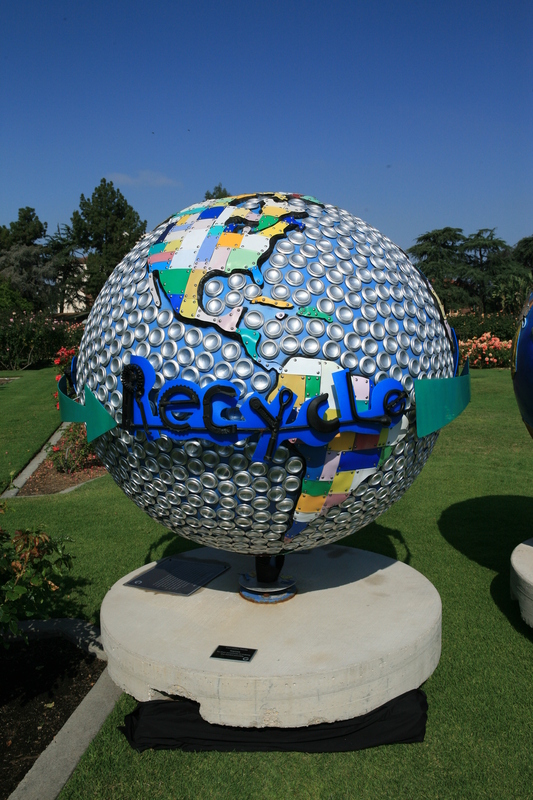 The energy conserved by recycling in the U.S. is enough to power 9 million households annually. Recycling one glass jar saves as much energy as it takes to light a 100-watt bulb for four hours. Recycling saves resources as well. If Americans recycled just 10 percent of their newspapers, it would save 25 million trees a year. 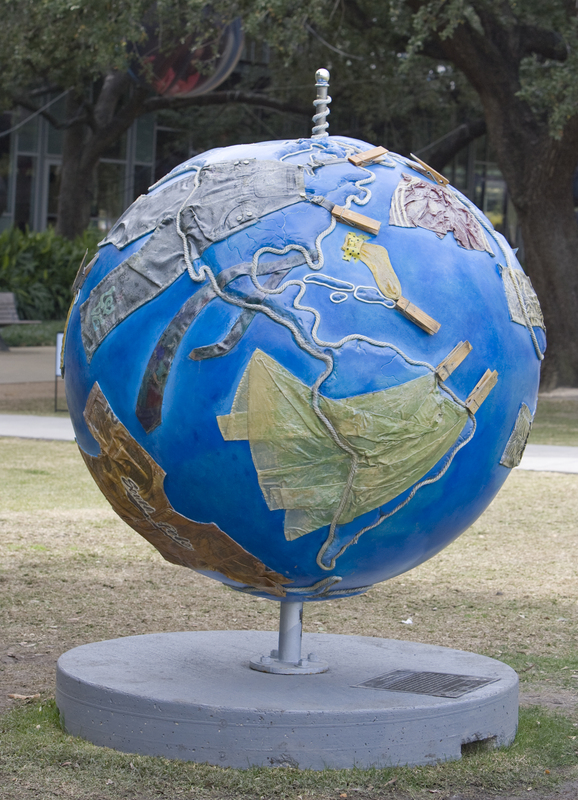 The medley of cell phones attached to Faheem Majeed’s globe call attention to the importance of both recycling and communication. As an added benefit, the construction of the piece allowed Majeed to educate the Gary Comer Youth Center participants on the value of reusing materials and respecting the environment. 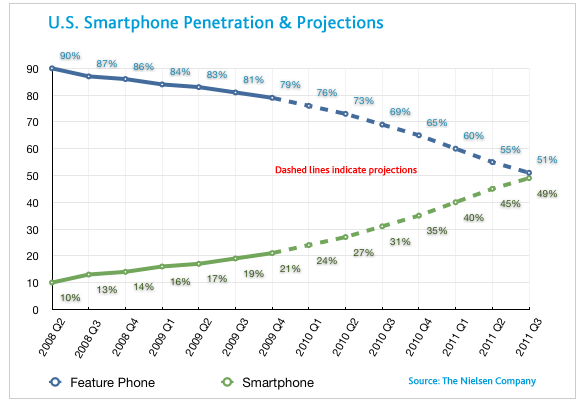 Title: The Comer Connection – plastics, metals and cell phones oh my! Taking public transportation is an easy way to lessen the globewarming carbon emissions produced by driving. A full bus takes 40 cars off the road; a full train can take hundreds. Commuting by train instead of driving cuts carbon emissions by nearly 5,000 pounds per year. Taking advantage of public transit also means avoiding the frustration of traffic jams and potentially engaging in more positive interactions with others in the neighborhood.Forming a collage of intricate drawings and wooden frames on her globe, Sue Sommers expresses the potential for community inherent in public transportation. Having used public trains and buses as her studio, Sommers portrays an endless stream of transportation riders who are connecting themselves to others even as they help conserve the environment. 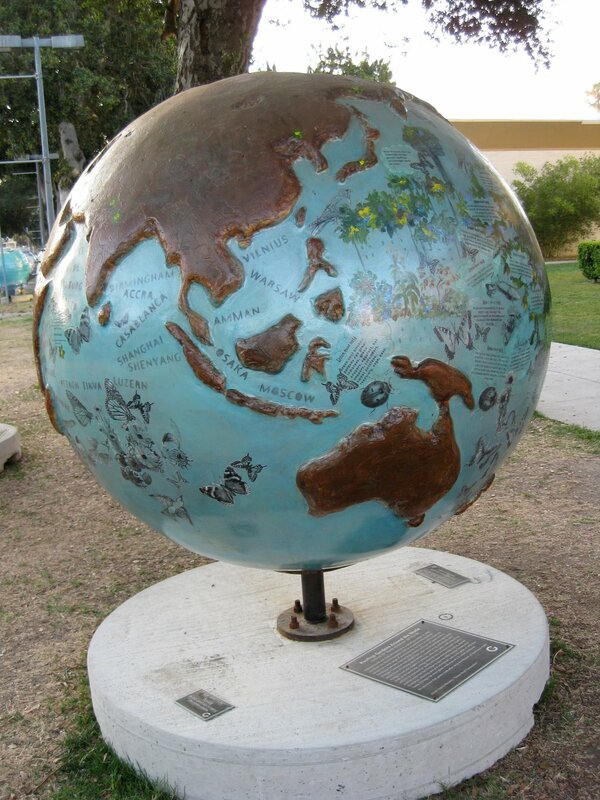 This globe focuses on the planet as the life source for every living thing as well as the material source for all technology. It illustrates the fine balance required if we are to be responsible stewards of our planet and how we can reduce our footprint through recycling and responsible living.Through mixed media and collage techniques each student has created a montage to illustrate the necessity for a balance between man and nature. The globe unfolds the progression of technology starting with natural resources to the technologies man has created then full circle to thoughtful and responsible recycling solutions. Think of yourself as a steward of the Earth – and maintain the balance of protecting nature while utilizing modern technology. A well-maintained car is significantly more fuel-efficient than a poorly maintained one. Regular tune-ups can increase fuel efficiency by four percent, properly inflated tires raise it by three percent, using the recommended motor oil adds a further two percent, and checking and replacing clogged air filters raise efficiency by a whopping 10 percent! All told, a serviced car can increase its fuel efficiency by as much as 20 percent and save thousands of pounds of carbon dioxide emissions each year. 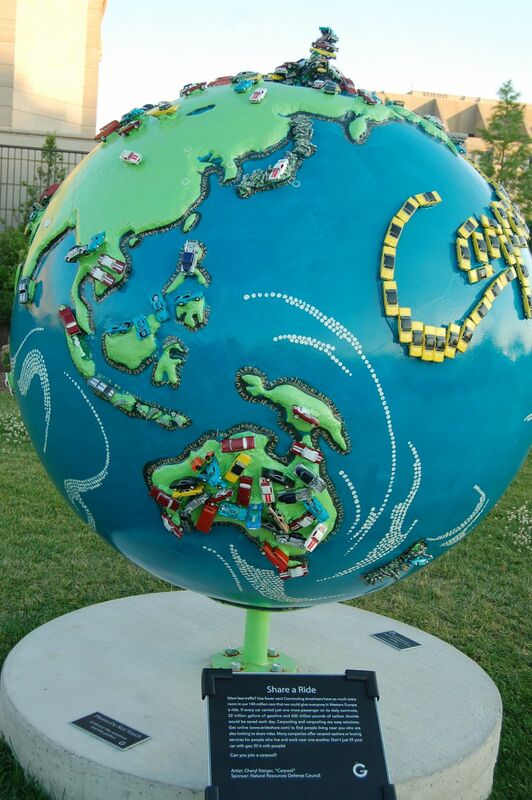 Incorporating tire treads and tire pressure nozzles, Derric Clemmons’ globe reminds viewers to properly care for their car’s tires. 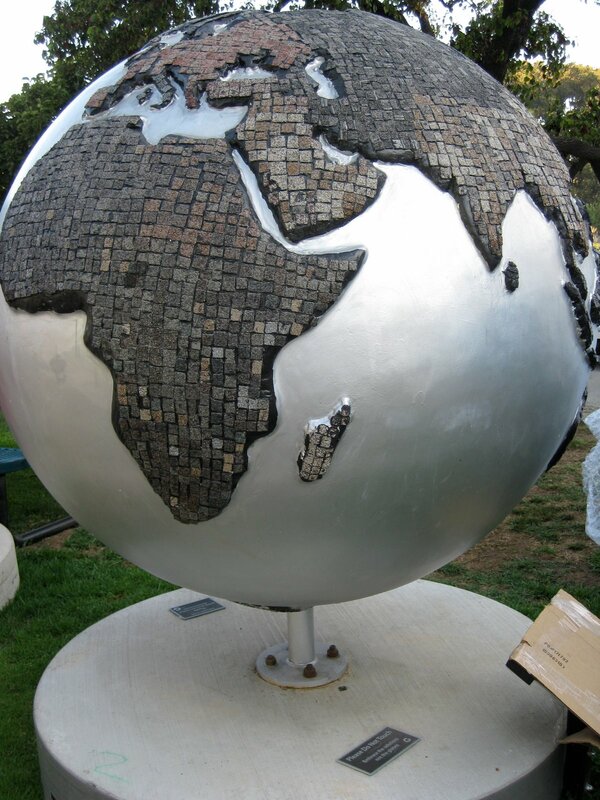 The “treads” placed above and below the globe are made of several different media, including cement compounds, sawdust and sand, and have been blown dry with heat. 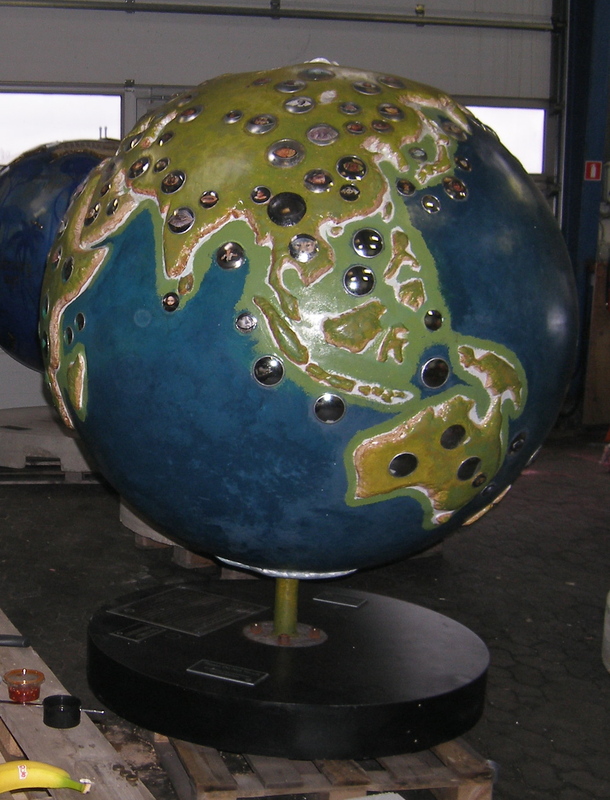 Each nozzle is chrome-plated to contrast the globe’s green hue and multicolored continents. 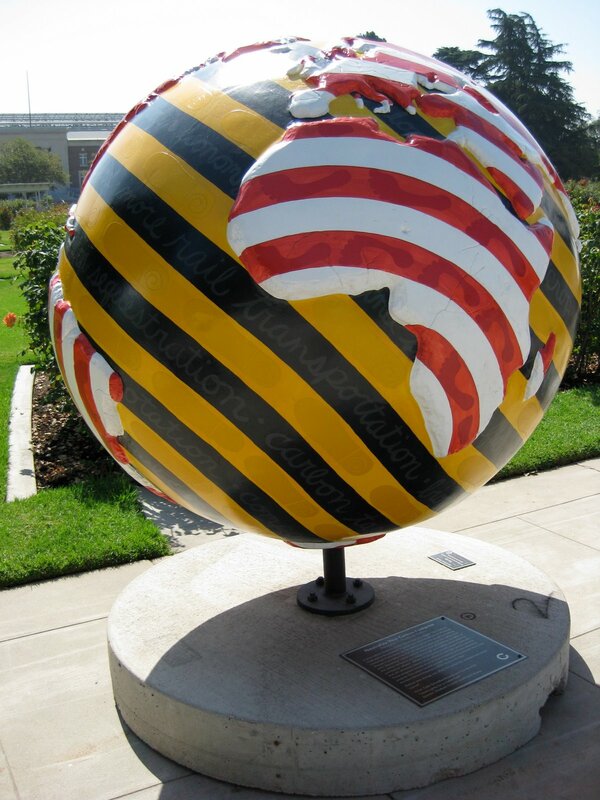 To highlight and honor the initiative’s 40 partner cities, Sandra Bacon painted translucent circular ripples of color around each area. The ripples represent the impact that each city’s carbon dioxide reductions can have on their surrounding regions. She hopes viewers will notice that many of the ripples overlap, showing the promising results of this initiative in a vivid way. Recycling and reusing are important, but what if we were able to avoid trash altogether? Over the last 35 years, the amount of trash each person generates has almost doubled from 2.7 to 4.4 pounds every day. 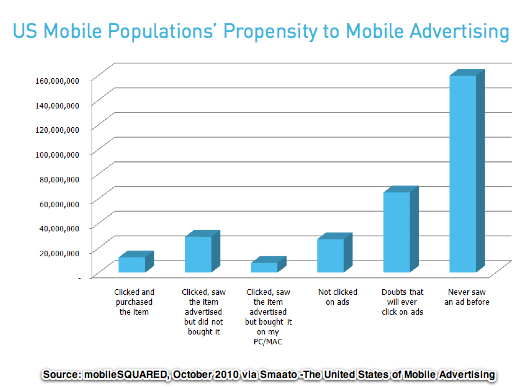 This shocking statistic can be lowered if we buy only what we need, and use all of what we buy. Product packaging accounts for one third of the trash we generate, so choosing products with reusable or readily recyclable packaging—or buying in bulk—will result in a much lower trash yield. Sustainable designer and artist Yair Engel spends a lot of time thinking about the amount of \”stuff\” there is in the world. An Israeli citizen, Engel came to the U.S. specifically to participate in this project. 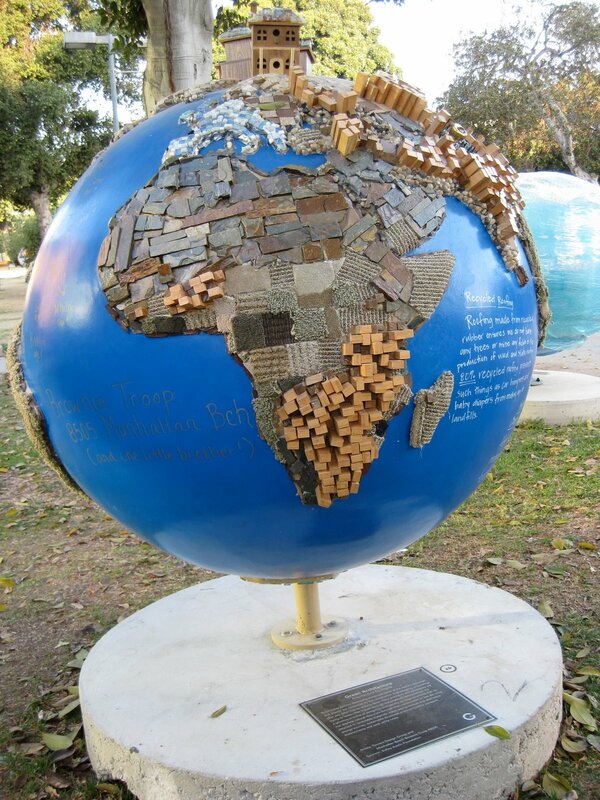 Using waste products like plastic shampoo bottles, used toys, and product packaging from Israel to achieve a highly three-dimensional effect, Engel\’s colorful and thought provoking globe issues an important missive: stop over-consumption of material goods. Research has helped us more fully understand the beauty and importance of natural treasures. Until a few years ago, Cordillera Azul, Peru, with its magnificent peaks and fog-shrouded forests, remained a mystery to all but a few. A team of experts from The Field Museum conducted a rapid inventory of this remote region, producing powerful documentation that resulted in the Peruvian government’s creation of this new 5,212-square-mile national park. The conservation efforts of The Field Museum have resulted in the safeguarding of more than 35,000 square miles of intact forests. These new protected areas are now safe from biodiversity loss and deforestation. Worldwide, deforestation is throwing hundreds of millions of tons of carbon dioxide into the atmosphere each year. These undisturbed forests soak up the damaging, excess carbon dioxide from the atmosphere. Wise words from many religious traditions call on us to be good stewards of our earth. Religious principles have helped advance many major social movements in the U.S., from the women’s right to vote to civil rights legislation. Today, religious leaders and interfaith campaigns are pressing for regional reductions of greenhouse gases. 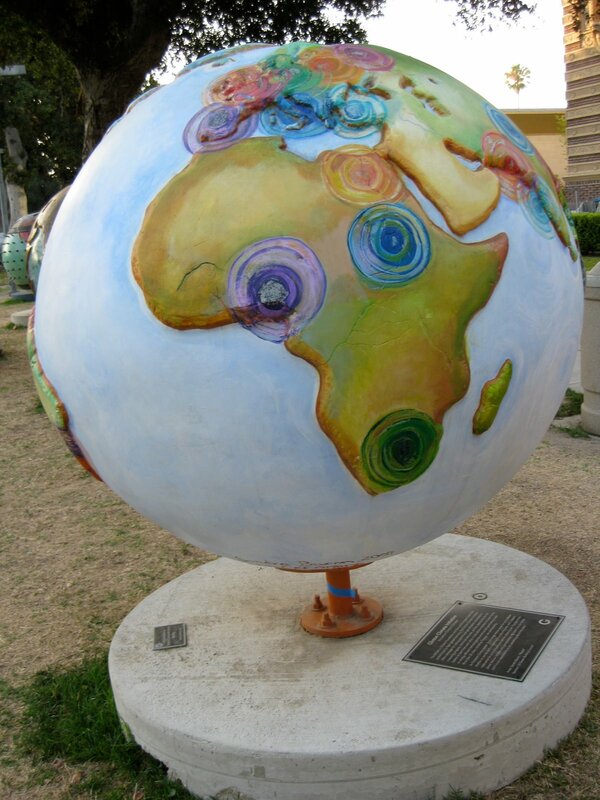 Many people believe that caring for the earth is a moral responsibility. Out of concern for our planet, future generations, and the impoverished who will be most impacted by climate change, the religious community is increasingly committing to combat global warming as a matter of justice. Faith in Place is a Chicago organization that gives religious people the tools to become good stewards of the earth—from organic communion bread, to solar thermal and lighting retrofits in places of worship, to teaching conservation practices as a matter of faith. Is your faith calling you to act? When it rains in Los Angeles, it pours! The pollutants carried by storm water seriously undermine the health of our ocean and the safe use of our beaches. As storm water rushes to the sea, it skips important ecological steps like slowing down, cooling and filtering by sinking into the earth. The best way to keep pace with this problem is to take steps to decrease water run-off from our personal property. Each of us here in Los Angeles can reduce the amount of rainwater that runs headlong off of buildings toward the Pacific Ocean collecting nasty pollutants such as fertilizer and petroleum products as well as pet waste and trash. Rain gardens easily transform yards into giant sponges with local plants and can allow 30 percent of storm water run-off to soak into the ground and be cooled and filtered naturally. We can route rain through downspouts to a rain barrel to store for irrigation or through pipes that feed onto a 4”–8” deep, 100–300 square foot space with local plants that promote soil absorption. This is inexpensive to achieve and will immediately benefit homeowners, our local beach and the ocean. Also, driveway surfaces can be made permeable with latticed paving to improve areas that promote absorption. Rainforests are the Earth’s oldest living ecosystems – and while they cover only about 6% of the Earth’s surface, rainforests contain more than half of the world’s plant and animal species. The destruction of the world’s rainforests is causing 20% of all of the global warming pollution in the world — about as much as all of the power plants, factories and vehicles in the United States every year. With the rainforests disappearing at a rate of some 1500 acres every hour, steps must be taken to reduce the losses. Governments should be encouraged to create large parks and reserves where logging and agribusiness are not permitted, and to protect indigenous peoples’ territories. As a consumer, shop consciously and support companies that make a commitment to safe environmental practices. 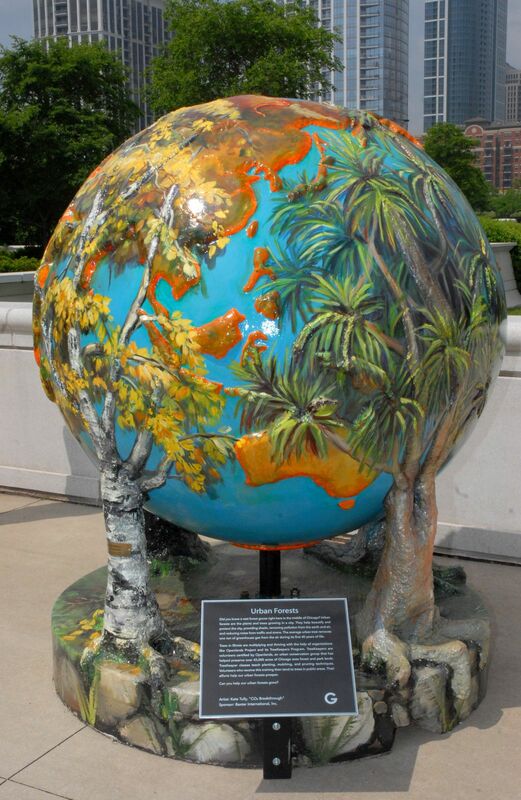 This globe illustrates the six eco-systems around the world through large scale paintings of vegetation, forests and mangroves. Many textures were used to create three dimensional effects and relief. Want to help fight global warming? Get fuel-efficient! Each gallon of gas a car burns puts 20 pounds of carbon dioxide into the air. Buying a car that gets 25 miles to the gallon rather than 20 will eliminate 17 tons of carbon dioxide from the earth’s atmosphere each year. New technologies, like hybrid cars, take fuel efficiency to an even higher level. Your next car can get 40 miles to the gallon or more! Just think, if we all drove cars with 40 mpg efficiencies, we would cut global warming emissions by one billion tons each year while reducing America’s dependence on foreign oil. Now that is dual impact! Further, everyone will appreciate the thousands saved in yearly fuel costs. The choice is yours. Title: One Man’s Trash…Don’t Waste—Instead Create! Build today without destroying tomorrow! More of the world’s resources and energy are consumed by the construction and operating of buildings than any other human activity. Now, many architects and developers are trying to lessen that impact through sustainable building design. It’s a growing practice of designing ecologically sensitive structures that do not deplete natural resources through their construction or use. By using recycled or renewable materials, water-saving devices and alternative energy sources, sustainable structures promote healthy occupant environments and save utility costs. Take action and get involved by voting and urging elected officials to pursue sensible environmental laws. Incorporate eco-friendly practices in the home, the workplace and throughout the community. Look into joining or volunteering with an environmental or community organization working to make a difference. 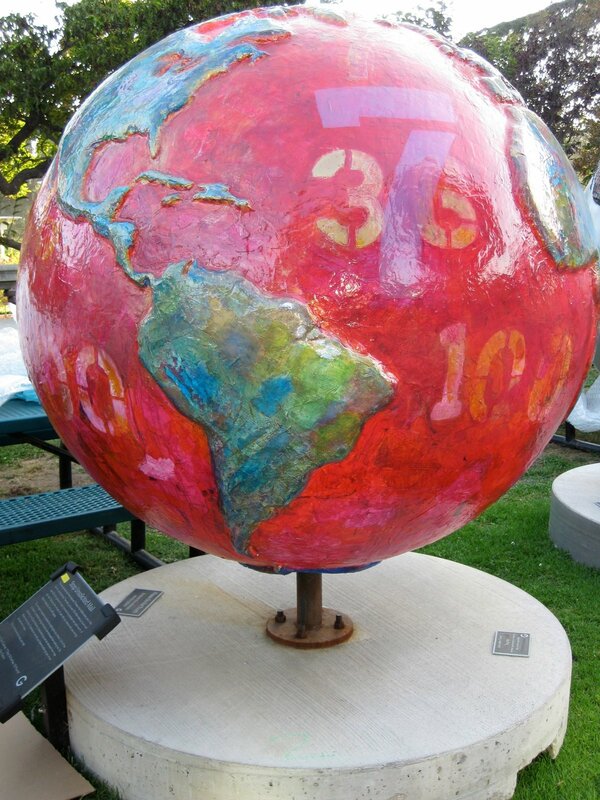 As Mahatma Gandhi said, “Be the change you wish to see in the world.” Nancy Steinmeyer has been exploring environmental issues through her artwork for the past 10 years, and global warming is her new target. 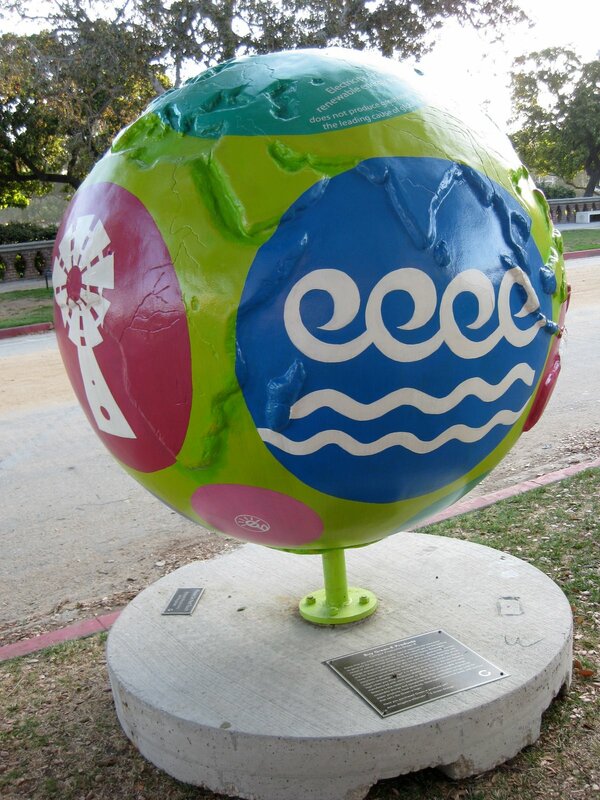 This globe reveals how every small action can add up to a large reduction in the emission of carbon dioxide gas into the atmosphere. A reproduction of Edward Munch’s famous painting “The Scream” might signify the planet calling out for help, while Steinmeyer’s “I want you” image of Uncle Sam provokes the viewer to act. Traveling the planet and enjoying its natural wonders is one of life’s greatest pleasures. But tourism—especially to some of Earth’s most untouched locations—can have ill effects. Eco-tourism provides a way to explore these treasures without leaving a footprint, so that they’ll be available tomorrow. Travelers should choose lodging and tour companies that respect nature, observe sustainable practices, and give back to the land. By becoming eco-travelers, people can ensure that future generations enjoy these unique environments as well. 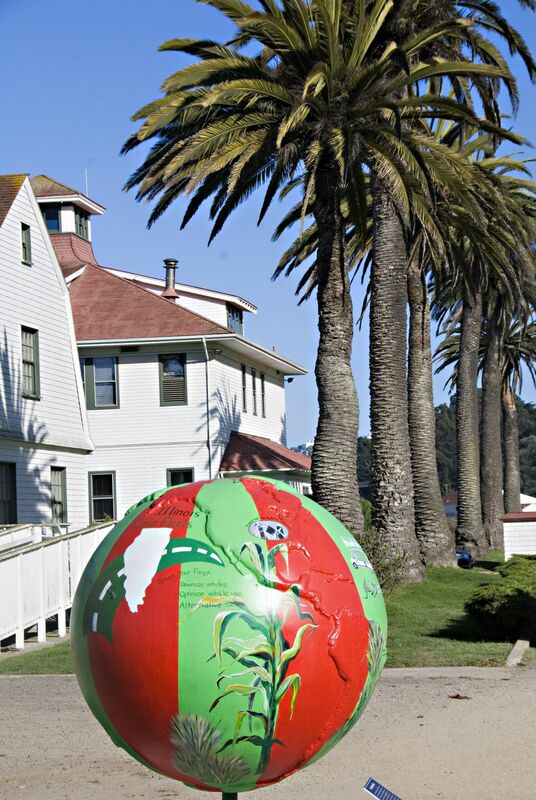 This ambitious painted-collage globe is a three-dimensional extension of Constance Mallinson’s muralesque landscapes. The globe uses thousands of images to provide a snapshot of the world’s most lush landscapes and epic panoramas, gently provoking a desire to conserve the precious environment even as it is explored. A growing number of cities worldwide are discovering that green roofs can be an aesthetically pleasing solution to a wide range of environmental concerns. Traditional roofs absorb heat, significantly raise city temperatures above those of outlying communities, increase smog and require extra energy to cool. In contrast, cities with green roofs enjoy lower air temperatures, energy expenditures and storm-water runoff, not to mention improved air quality and greater capacity for wildlife habitats. 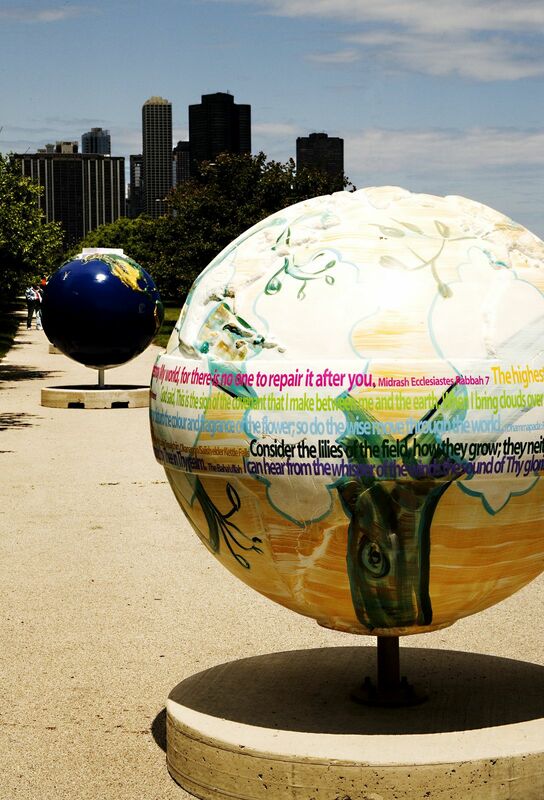 From Cool Globes’ launch in Chicago in 2007, this globe highlighted Chicago’s leadership role in rooftop gardening. 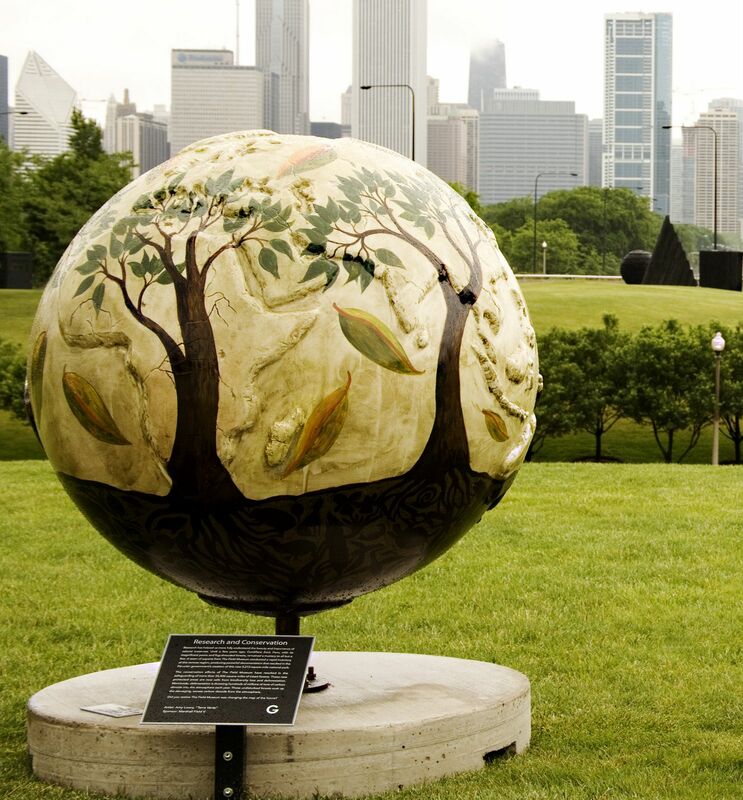 Pinpoints of Chicago’s 22 sister cities are intermingled with information and images of how green landscaping – including native planting, creating habitats for migrant birds, and growing your own fruits and vegetables – might flourish through the sister cities network. Every time you switch on your lights, natural resources are consumed to generate the electricity you use. 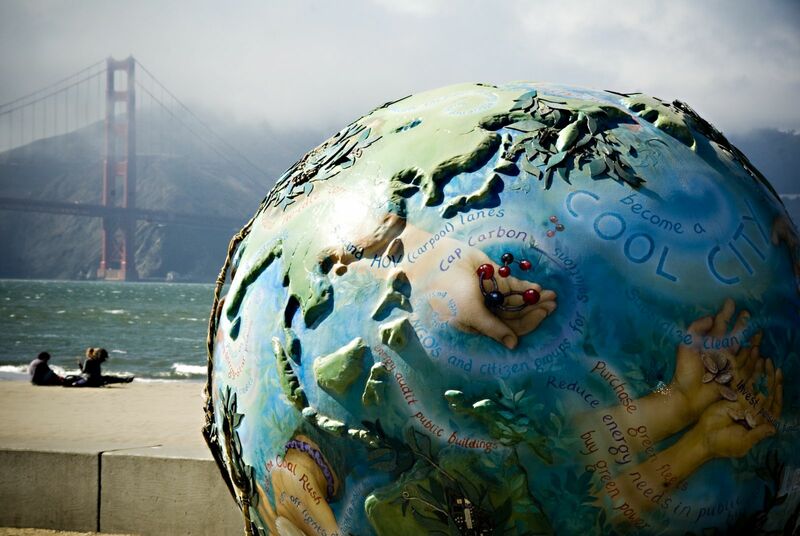 Coal and natural gas are the leading causes of carbon dioxide emissions in the United States. Renewable energy sources such as wind turbines, solar electric, geothermal, biomass, and low impact hydropower can also be used to produce electricity with fewer environmental impacts. At this time, however, less than 9% of U.S. electricity is generated from renewable sources. How would you like to support renewable energy? It is as easy as looking for the new Green-e logo when you shop. Products labeled with the Green-e symbol were manufactured with wind power or other forms of renewable energy. Green-e is the nation\’s leading independent certification program for renewable energy and companies that use renewable energy. Look for paper products, food products, beverages, household items, and services that carry the Green-e logo. Get in touch with the earth by growing fruits, vegetables, herbs, and flowers. Instead of buying produce that has been packaged and shipped, enjoy homegrown fruits and vegetables—fresh from the garden to the table. Even those without a backyard can green their neighborhood by working in a community garden. 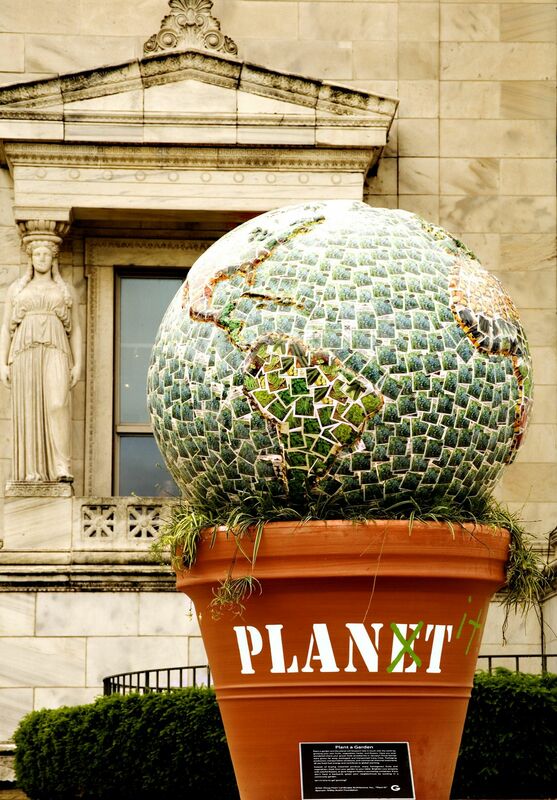 More than 2,000 colorful seed packets envelop this globe as it rises like a flower from a terracotta style pot filled with live plants. Gardens absorb carbon dioxide, reduce the amount of energy from the sun that is retained by paved surfaces, and slow rainwater flow into storm-water sewer systems. They also help people actively tend the earth and tune in to its changes. The artist demonstrates that planting a garden need not be a huge endeavor. Even a small pot or container garden can make an impact. Do you enjoy skiing, snowboarding, or just throwing snowballs? Winter sports as well as snow itself could be a distant memory by as early as 2100. If we don’t fix global warming trends in the next decade, by 2050 snow could be a rare event, even in the mountains. That’s why Aspen/Snowmass is taking steps now to become the most eco-conscious ski resort with a Save Snow campaign, the snow sport industry’s first climate policy. Aspen/Snowmass offsets 100% of its electricity use with wind power and renewable energy certificates. It is also the first winter resort to fuel all of its snowcats with bio-diesel. In addition, the ski area built the industry’s two largest onsite renewable projects: the Aspen Highlands solar energy system and the Snowmass micro hydro-electric plant. Don’t let winter become a wipeout! Traditional Iroquois Indians have been guided by the following wise principle: In our every deliberation we must consider the impact of our decisions on the next seven generations. The Iroquois nation made many decisions based on respect for the natural environment and the need to nurture the future. The ability to take action today is our only hope for tomorrow. 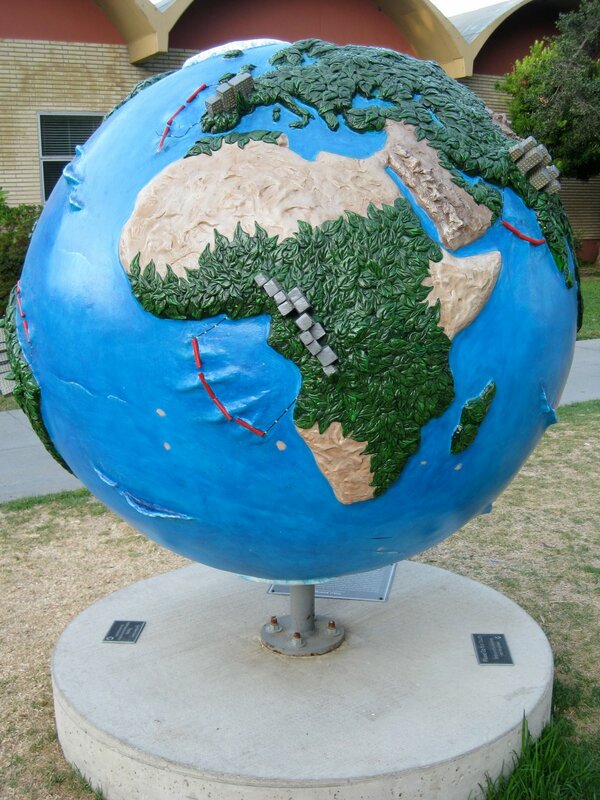 We can be inspired by other cultures and learn from them the importance of respecting the earth. 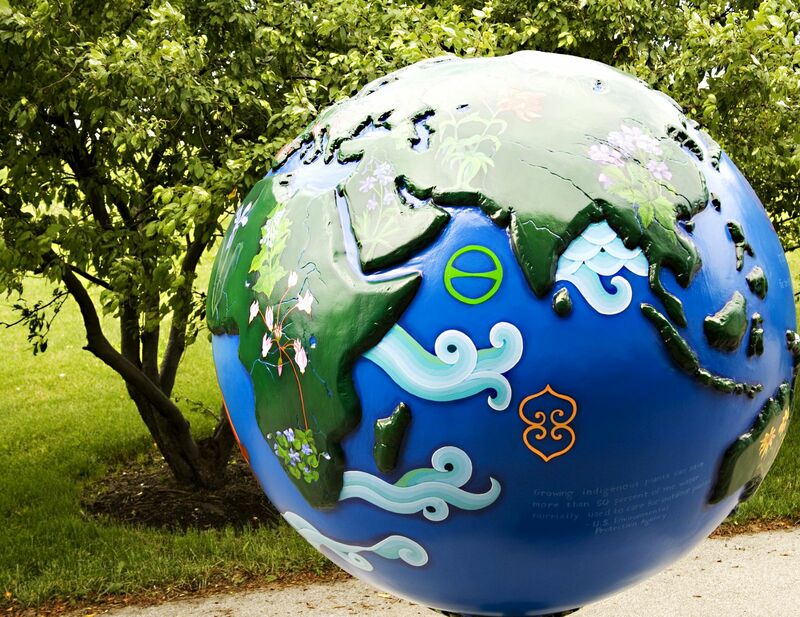 The simple act of landscaping with water-saving native plants, such as the Illinois wildflowers shown on this globe, can make a difference. Your efforts to clean up our air and water, preserve our natural resources, and protect plant and animal species will benefit our children and future generations. How will the environmental choices you make today impact your descendants? Far off destinations are exciting, but they present a downside. In one year, airplanes produce more than 600 million tons of carbon dioxide. That is more CO2 than the annual emissions from the entire continent of Africa. The contrails, or long \”clouds,\” produced by airplanes also affect climate change. They can remain in the atmosphere for extended periods, contributing to the greenhouse effect. Airplane manufacturers are helping by addressing the fuel efficiency of their aircraft. Remarkably, new planes are 70% more efficient than 40 years ago, and the industry is aiming for another 50% improvement by 2020. Already, new commercial aircraft will achieve a fuel efficiency of 3 liters per 100 passenger miles—better than most cars! Of course, the most climate- friendly solution is fewer flights: Use teleconferencing for virtual face-to- face business contact. 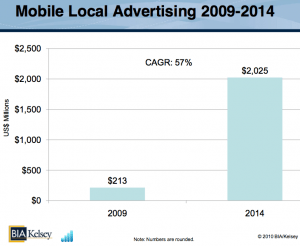 Think local when planning your next vacation. Urban forests are the plants and trees that beautify and protect a city, provide shade, remove pollution, and reduce traffic noise. The average urban tree removes one ton of greenhouse gas from the air during its first 40 years of life. \”Treekeepers\” are volunteers certified by the Openlands Project of Illinois, an urban conservation group. Treekeepers tend trees in public areas, helping urban forests to prosper. Kate Tully presents one of the most basic solutions to global warming available: planting trees. 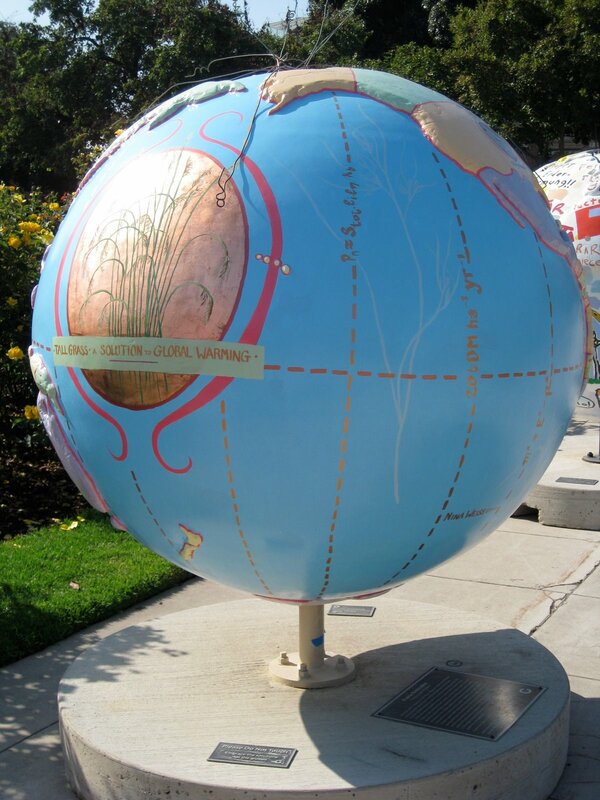 Tully covered her globe with four different types of trees, overlapping the region of the world from which they originate, and identified with a nameplate. Continents peek out from beneath each tree, painted with an orange glow to symbolize the overheated Earth. The trees, conversely, are tinted with cooler colors to represent their cooling effect. Change the world one light bulb at a time! Compact fluorescent lights (CFLs) use about one quarter of the energy of incandescent bulbs and last 10 times longer. If every American household switched one light bulb to a CFL, it would save enough power to light 2.5 million homes for an entire year. If each family replaced five incandescent bulbs in frequently used rooms, it would be like taking 8 million cars off the road. To highlight the distinction between energysaving and energy-draining bulbs, Derric Clemmons presents both in his globe. Cooling and warming colors of light flow like waves from the CFL bulb, while blackened, coal-burning strands of soot stream from the incandescent bulb. The incandescent bulb looks rough, identifying it as a Stone Age technology that needs to be abandoned to save the planet. They are young, but wise. Children’s voices can be heard around the world in a multitude of languages, all speaking the same message: Stop global warming! ¡Paren el calentamiento global! From Kenya to Kazakhstan, youngsters are leading the way by recycling, replanting and reminding us that solutions are simple enough for even a child to understand. Kids are gathering kitchen waste for composting in India, creating energy conservation posters in Norway and helping plant 250,000 trees in Lebanon. 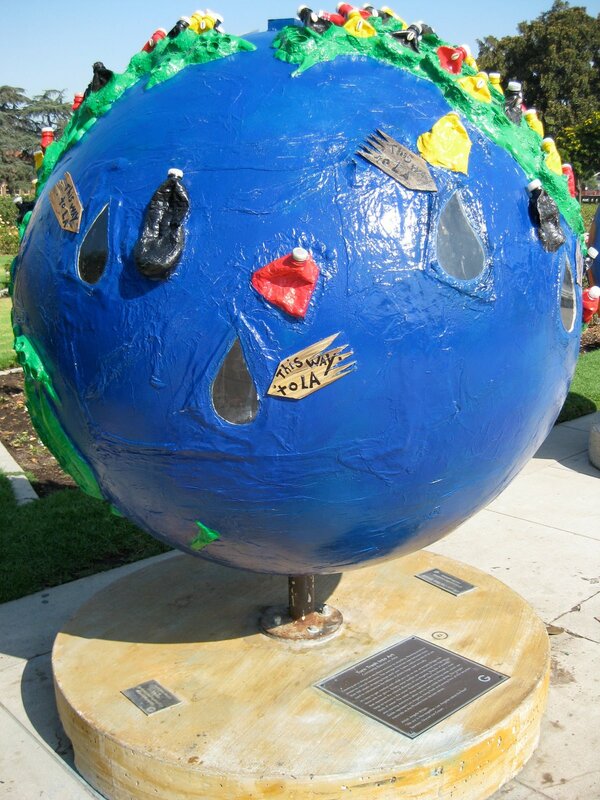 In an international classroom project, global warming solutions listed by children from 20 countries included carpooling, turning off lights, taking oral or online exams to save paper, and holding a solar oven bake sale to benefit environmental groups. 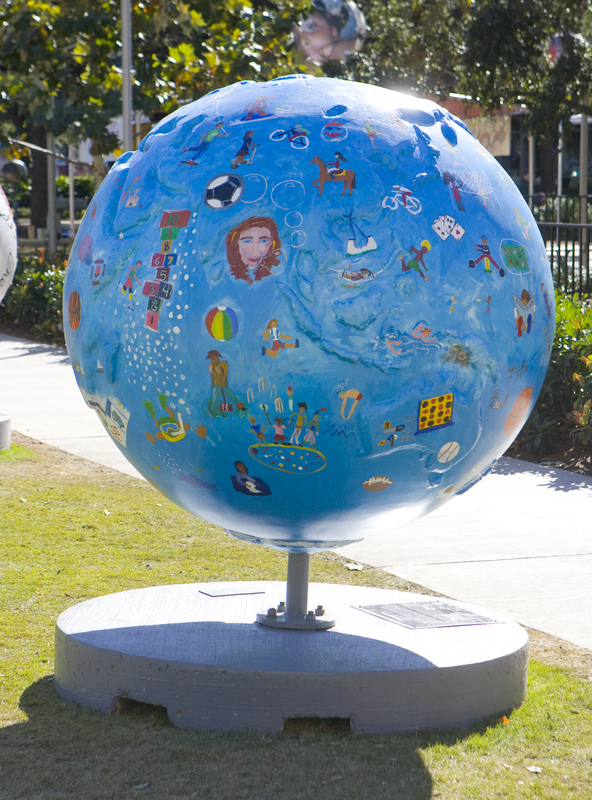 This globe displays artwork sent in by children around the world and illustrates their ideas for solving global warming. Children are speaking out – let’s listen! Converting traditional lawn into prairie is an attractive landscaping solution that significantly reduces household energy consumption; there is no need to mow, irrigate or apply petroleum-based fertilizers. As leaves release oxygen into the air, dense prairie root systems capture carbon, a phenomenon known as “carbon sequestration” that mitigates global warming. Using copper tubing to symbolize hearty, native tall grasses, Nina Weiss spotlights native grasses grown worldwide. 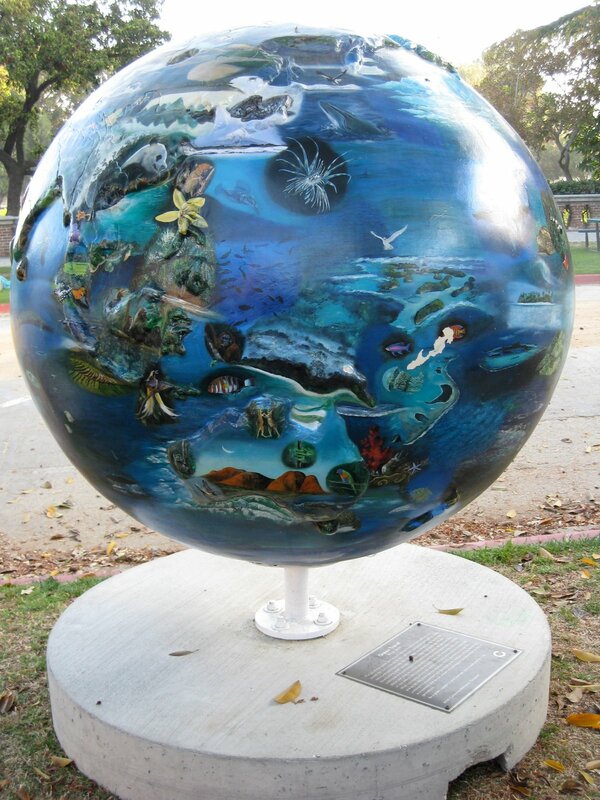 Weiss’ globe incorporates the visions and textures of nature, to show how maintaining tall grass regions helps offset the effects of carbon dioxide in the atmosphere and provides a renewable source of biomass to convert into energy. Up to 45 percent of discarded waste in the United States is generated by businesses. A good part of this waste stream can be reduced, recycled and reused. Businesses should conduct waste audits and implement waste reduction and recycling programs. These practices not only save businesses money, but also conserve energy and natural resources and reduce greenhouse gas emissions. 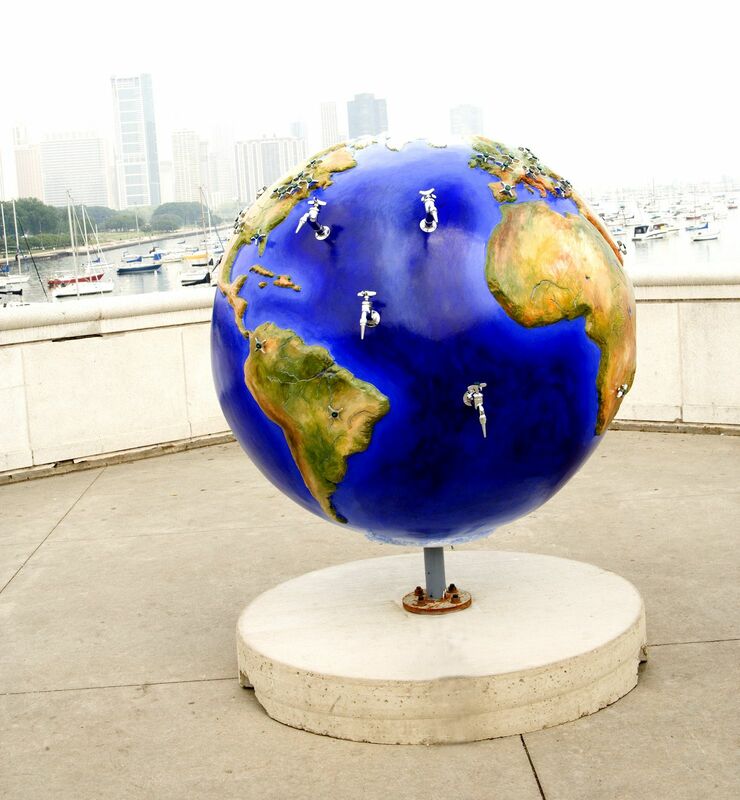 Bryan Sperry’s globe raises awareness about this collective commercial responsibility to pay attention to how the planet is treated. 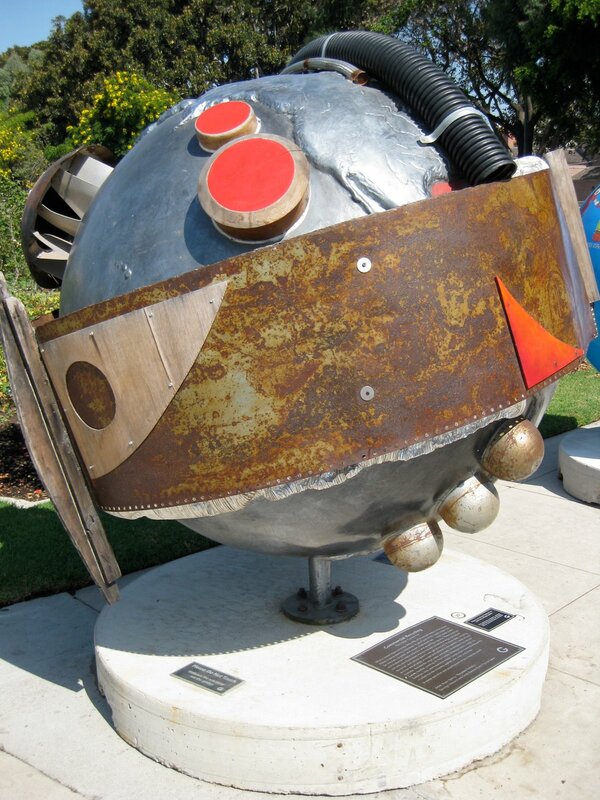 Applying a variety of recycled material to the surface, including stainless steel, rusted sheet metal, rebar and wood, Sperry’s globe drives home the idea that humans create far more waste than is healthy for the planet. School districts are learning to save energy. More efficient energy use in schools can cut utility costs by 25 percent and reduce global warming. As a result, new buildings are incorporating solar panels and green roofs. Old schools are changing light bulbs and caulking windows. American K-12 schools could save an estimated $1.5 billion by increasing energy efficiency – enough to hire 30,000 more teachers or buy 40 million new textbooks. 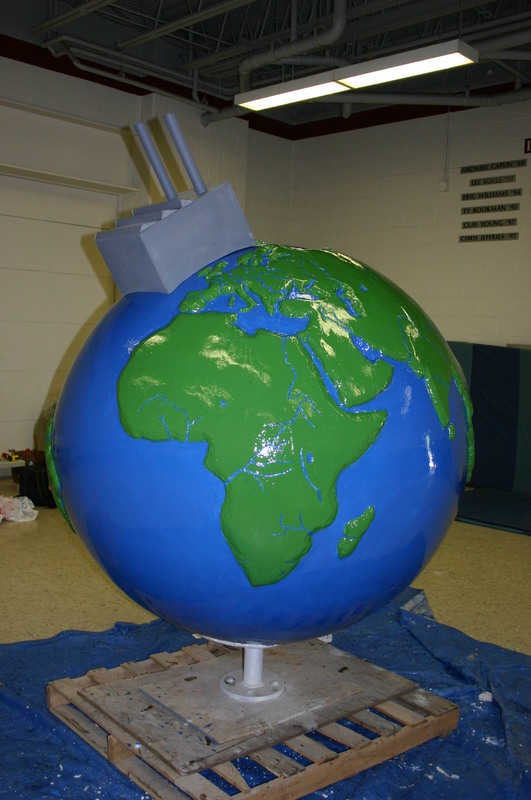 Seeking to highlight the benefits of green schools, the Lawrence Hall Youth Service used a collaborative approach to paint this globe. The artists added images of green schools, as well as the proposed design for the center’s redevelopment by architecture firm McBride, Kelley and Baurer, a member of the U.S. Green Building Council. Since 1900, the human population has nearly quadrupled and globe-warming CO2 emissions have increased twelve-fold. Looking ahead, the world is facing a serious challenge in inevitably rising fossil-fuel consumption and explosive population growth in developing nations. Experts suggest that the solution to the population problem may be increased access for women to health care, education and economic opportunity. 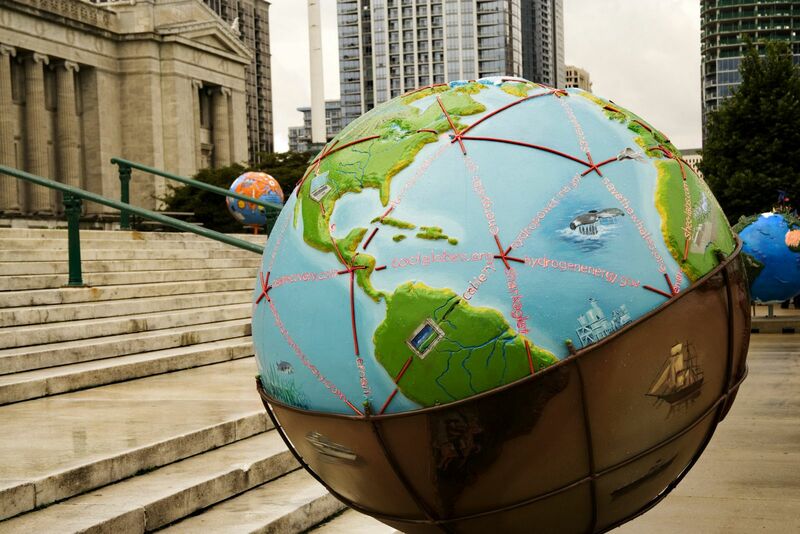 With paint and four common colors of fabricated plastic pills, Darrin Hallowell’s globe maps out global population densities. The pill colors that extend across the globe’s continents represent population size per square kilometer: blue indicates populations of more than 1,000 people per square kilometer, green is 501-1,000, pink, between 101-500, and yellow, between 1-100. Hallowell’s interpretation is a striking illustration of population and its effects on resources. Becoming “carbon neutral” means that one can balance the effect of the carbon emissions created through energy consumption by purchasing “offsets.” Offsets are financially supported programs that will ultimately reduce carbon emissions and fight global warming. Those programs include wind farms and replanting tropical rainforests. The carbon neutral concept has become so popular that it was the New Oxford Dictionary’s 2006 Word of the Year. 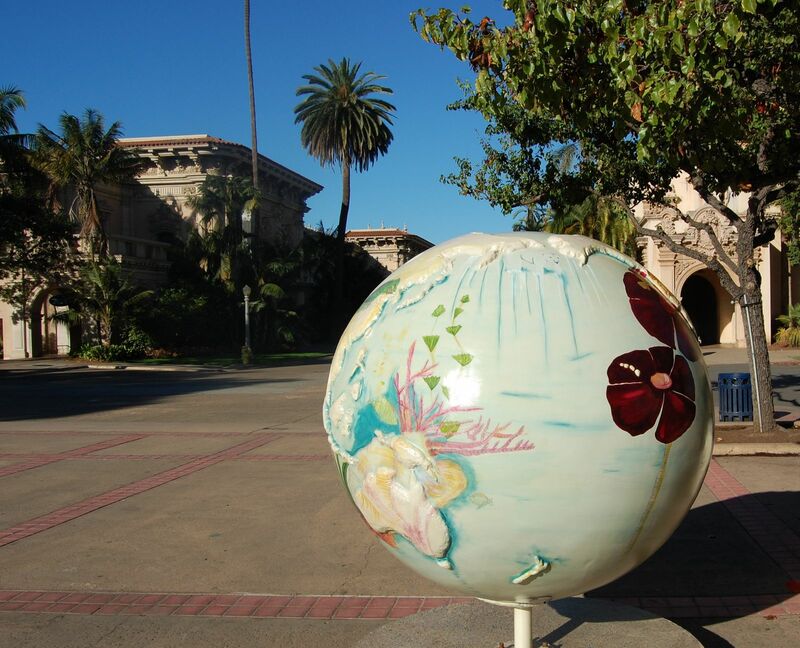 Personal impact and responsibility inspired Cathi and Paul Bouzide’s globe. Every action has an impact on the planet measured by greenhouse gas emissions or a carbon footprint. 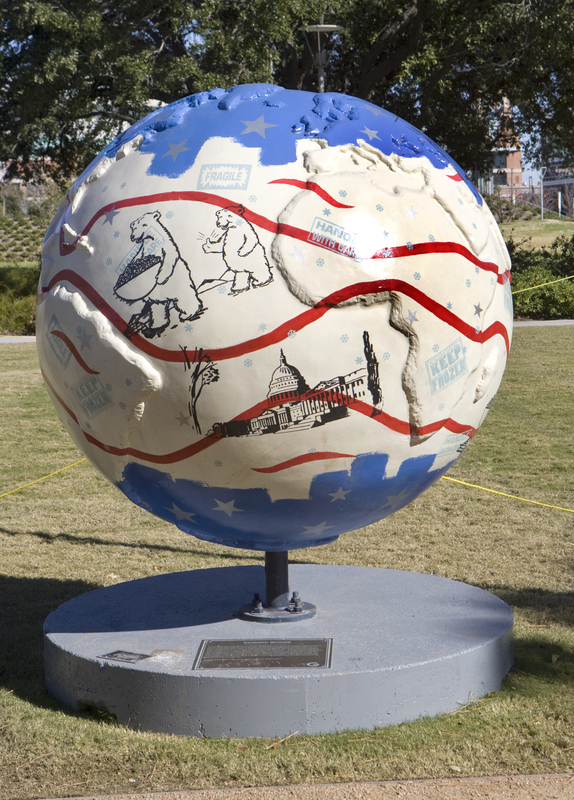 This globe is literally covered with footprints of children and adults layered over cautious stripes, which represent land and water masses. Suggestions on how to reduce carbon footprints are a reminder that things can always change for the better. Green manufactured products are designed to use less energy, weigh less, use less packaging and contain fewer hazardous substances than products constructed without the environment’s needs in mind. They are also built to last longer and are easy to disassemble so that components may be recycled. While most products are dumped into landfills at the end of their life, green products and their components are meant to be used again and again. 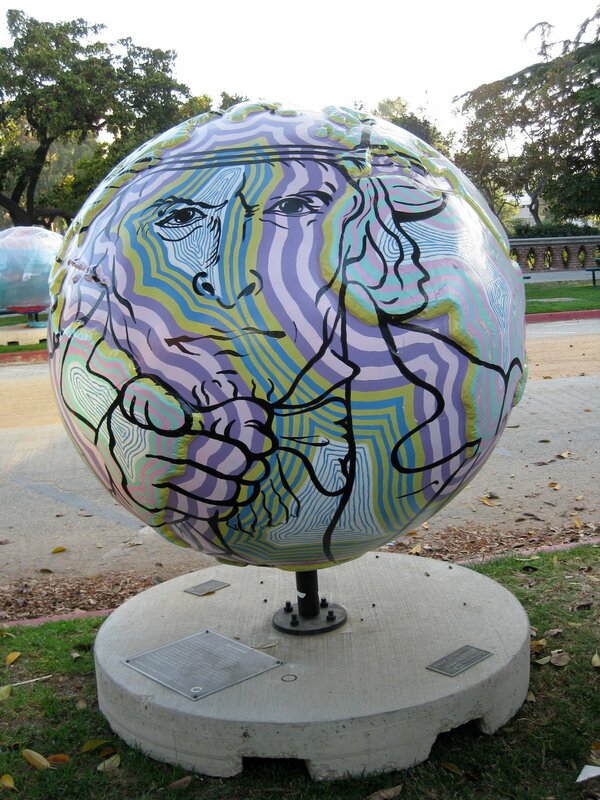 To begin a similarly cyclical interaction between the viewer and this solution to global warming, David Gista crafted his globe to mirror its own audience. 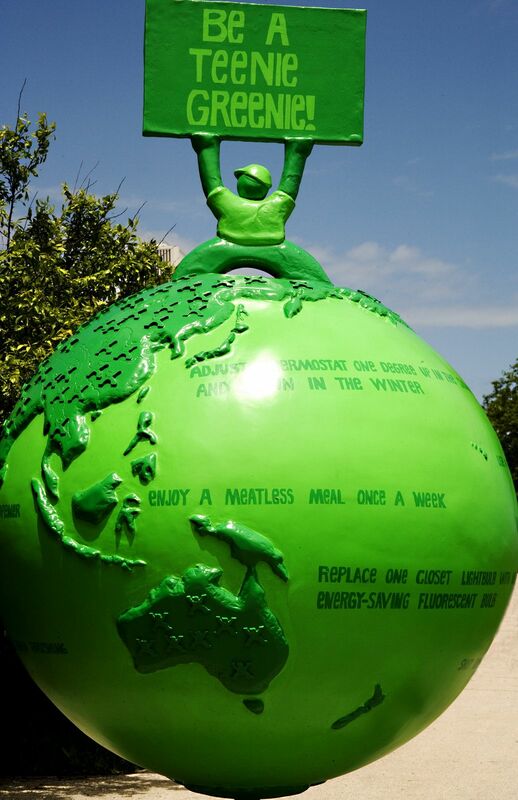 In a literal revelation of this intended dialogue, the painted audience on the globe itself seems to encourage people to participate in the process of green manufacturing, simply by paying attention. After the devastation of Hurricanes Katrina and Rita, the rebuilding of New Orleans and other Gulf Coast cities offers a chance to get it right. Where global warming may have contributed to destructive storms, a movement is now underway to reshape these cities into showcases for green living. Global Green USA has partnered with Habitat for Humanity and others on the Gulf Coast to build several model green schools and 10,000 affordable, environmentally friendly homes. 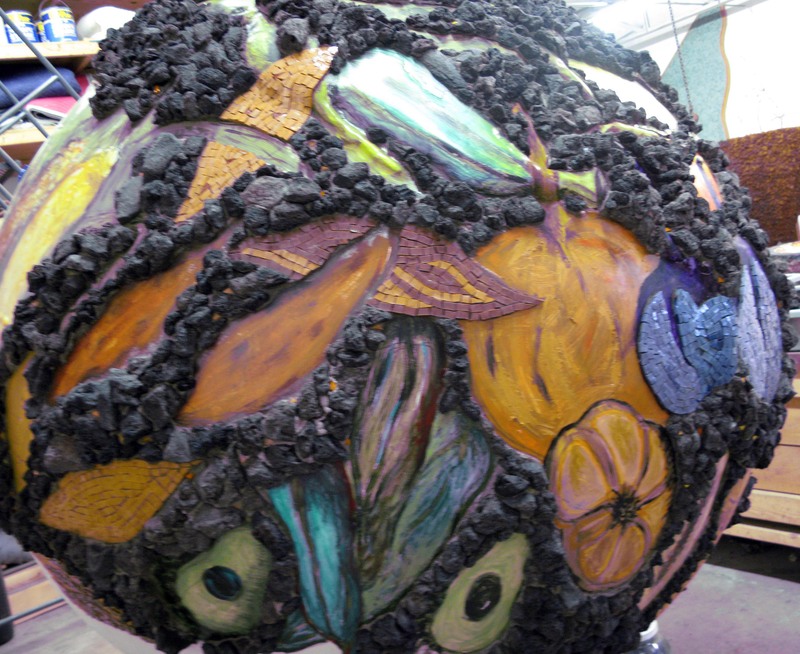 Casting New Orleans as her subject, Karen Perl portrays a culture that was once passionately tied to traditions, surviving tragedy and beginning again. With vignettes, including landmarks, a funeral procession and voodoo symbols, Perl, whose own family members survived the devastation in New Orleans, tops her globe with a “healthy” Mississippi River, complete with green architecture and returning pelicans. Technology has come a long way since Thomas Edison’s time, but his light bulb has changed little in 125 years. Incandescent bulbs use electricity to heat a metal filament, with only 10 percent of the energy creating a visible light. Better lighting solutions are now catching on. Light emitting diodes (LEDs) are being widely used commercially in billboards and exit signs. At home, LEDs give directed illumination in desk lamps and porch lights, which compact fluorescent bulbs are most effective for wider room lighting. 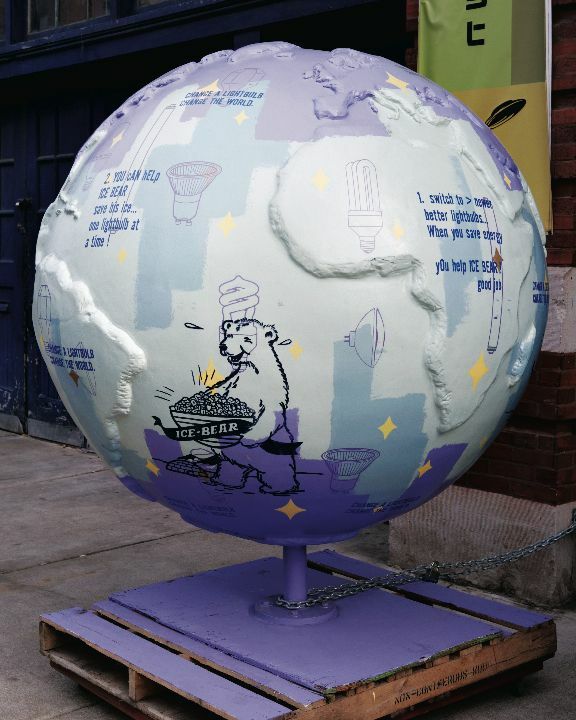 In this exuberant globe, Peter Mars blends classic imagery with contemporary objects by introducing his trademark polar bear to the energy-saving light bulb, an icon of the modern environmental movement. With his avant-garde take on Pop Art sensibility, Mars imbues the switch to eco-friendly bulbs with accessibility and fun. Sustainability is a top priority as corporations focus on not only products produced, but on the manufacturing process as well. Responsible manufacturing incorporates increasing energy efficiency, eliminating waste, recycling of materials, and lowering carbon emissions in factories. Corporations are proving there is green in being green – among Fortune 100 companies, 60% adopted sustainable practices. Environmentally conscious manufacturers are developing products that can be more easily recycled at the end of their useful life-cycle, aiming to avoid landfill waste. Karen Ami\’s design features smokestacks blossoming and spewing nature: flowers and plants, hopefully creating a balance between the modern industrialization and mother earth. 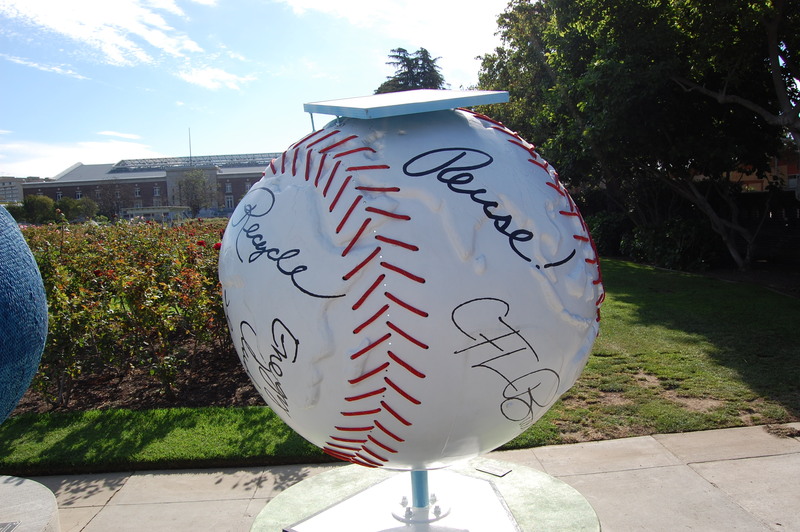 The saying “best alone, better together” is fitting for a major league baseball team, and also holds true when it comes to solutions to global warming. Positive steps like switching to CFLs are good, but are even better when combined with other efforts, such as recycling and conserving water. Share a ride on the way to work. Drink your coffee from a re-useable mug. A strong left fielder can’t make the game if his first baseman can’t catch. Consistency is key in this fight against global warming, so keep up the positive actions. With a little effort, we can all be a team in this cause. Stepping up to bat for the environment is a homerun! Global warming may feel like an overwhelming challenge, but artist Paula Clayton seeks to demonstrate that every individual has a voice, and by joining hands and raising our voices together we can help fight global warming. Specifically, by making small changes in our own lives, such as carpooling and buying local products, we can demonstrate our collective commitment to helping fight global warming and encourage business and government leaders to do the same. For example, communities may institute better recycling programs, businesses may adopt carbon neutral policies or elected officials may pass legislation requiring stricter minimum standards for protecting the environment if we let our voices be heard. So many of us want to volunteer and give back to the communities in which we live and work. We want to clean up parks, beaches, trails and rivers; repair urban greenscapes by planting trees; set up recycling programs; and educate school children about environmental issues. But with work and family demands, who has time? One solution is corporate volunteerism. By encouraging their employees to get involved in community service, companies build a reputation for direct involvement in their communities and reap substantial benefits. Employer-based volunteer programs help with recruiting and retention, plus the company builds goodwill among potential customers who recognize their good corporate citizenship. Corporate Environmental Volunteerism…good for the company, good for the employees, good for the community and good for the PLANET. 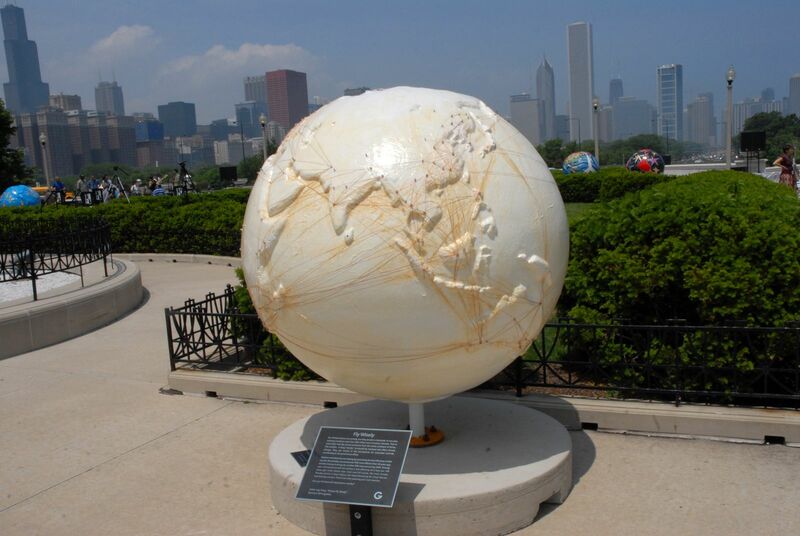 Cool Globes launched in Chicago during the summer of 2007. 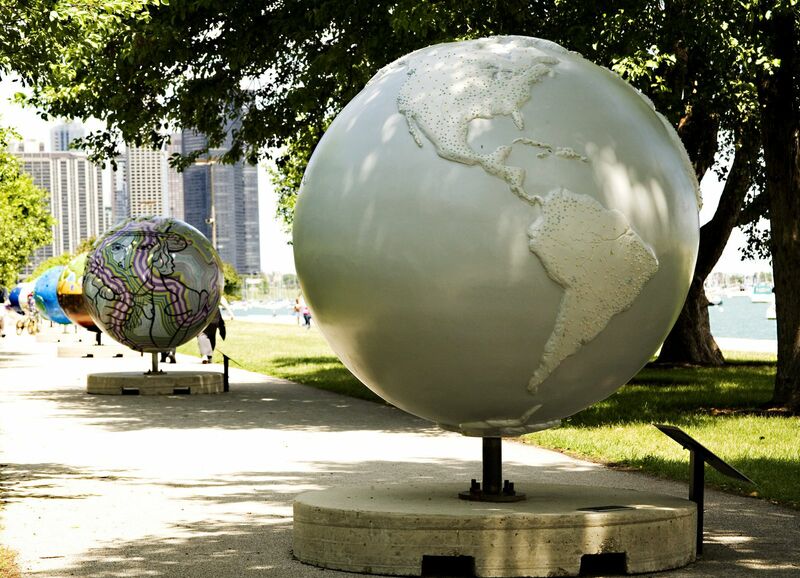 This globe features the voluntary Illinois Green Fleets Program, which gives businesses, communities and organizations recognition if they use environmentally-friendly vehicles and fuels like ethanol, biodiesel or natural gas. Many organizations have already signed up, including zoos, forest preserves, universities and restaurants. 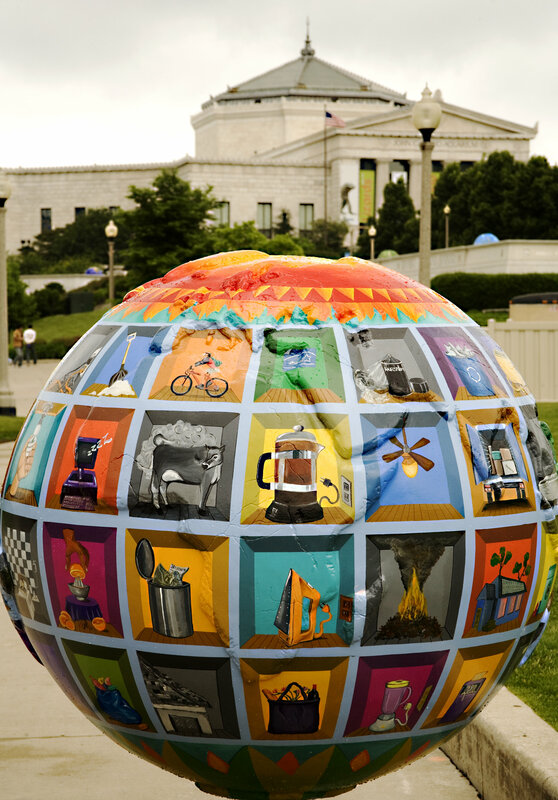 Highlighting this program, Peta Kaplan-Sandzer’s painted globe juxtaposes the businesses and organizations that choose clean, green, domestic, renewable-fuel vehicles against those that do not. Kaplan-Sandzer illustrates the initiative by featuring a case study of the Illinois’ Brookfield Zoo, a Green Fleet participant. The slices of red (oil) and green (corn stock) are overlaid with a graph demonstrating greenhouse gas emission trends. 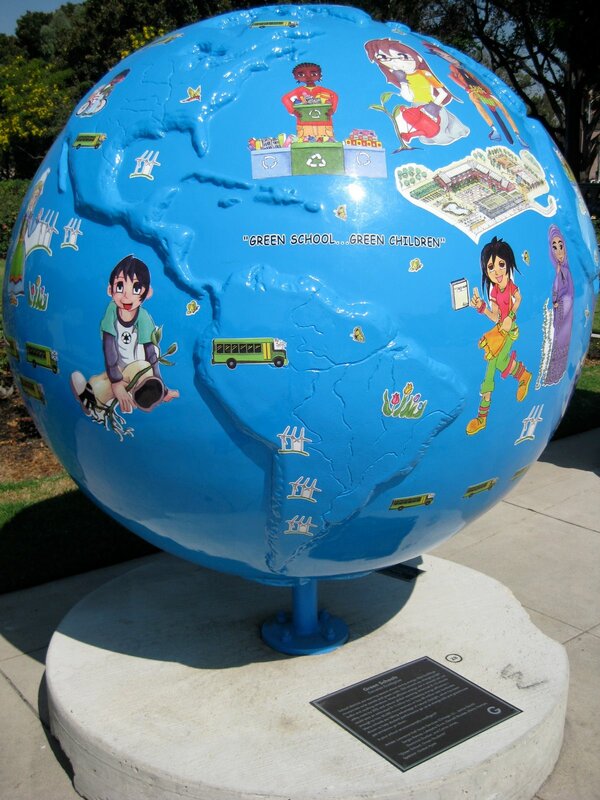 Ultimately, the globe shows Green Fleets as a true driving force in the fight against global warming. One way to reduce global warming is as close as the nearest intersection. The energy and globe-warming pollution produced by stoplights is reduced by 85 percent every time an old bulb is replaced with a light emitting diode (LED). If one major city changed its stoplights to LEDs, it would save about $2.5 million in annual energy costs and to decrease carbon dioxide emissions by 1.2 million tons per year. 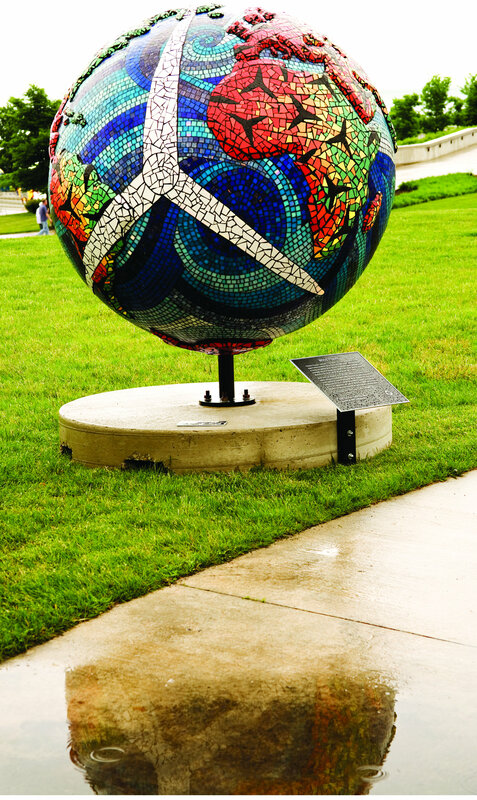 Powered by an LED solar panel, Lee Strickland’s globe features lights that have been fashioned into fruit and plant shapes to demonstrate that their power comes from an Earth-friendly source. With the addition of lamps and signs from different countries, Strickland illustrates how LED lights, which take a fraction of the energy to create, double the light everywhere in the world. Scientists and engineers circle the globe investigating how and why Earth’s climate is changing, and identifying ways to restore our planet’s natural balance. 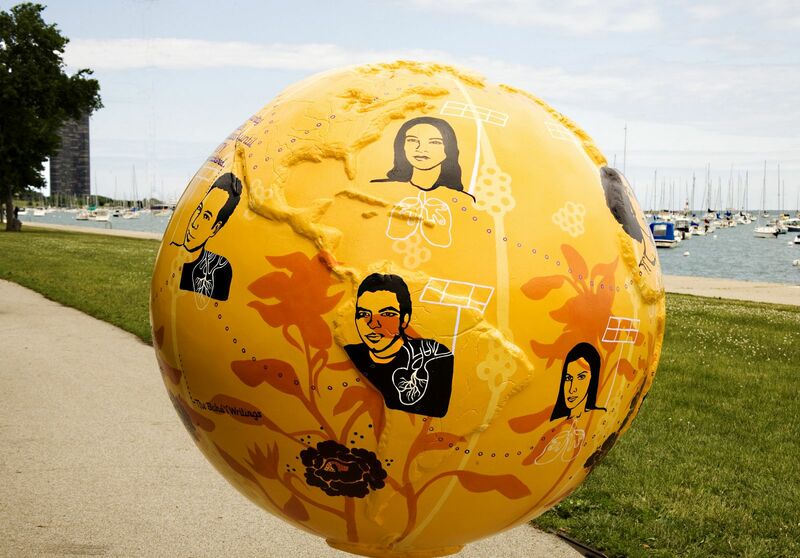 The cool jobs on this CoolGlobe are just a few of the wide variety of science careers, from atmospheric chemistry to zoology, Sally Ride Science ™ has introduced to young people. Through our programs and publications we bring science to life and involve girls and boys in the creative and collaborative world of science. Commuting Americans have enough extra room in their 140 million cars to give all of Western Europe a ride. If every car carried just one more passenger on its daily commute, 32 million gallons of gasoline and 600 million pounds of carbon dioxide would be saved each day. The Internet and directories or bulletin boards at work are good places to find nearby people to share a carpool. 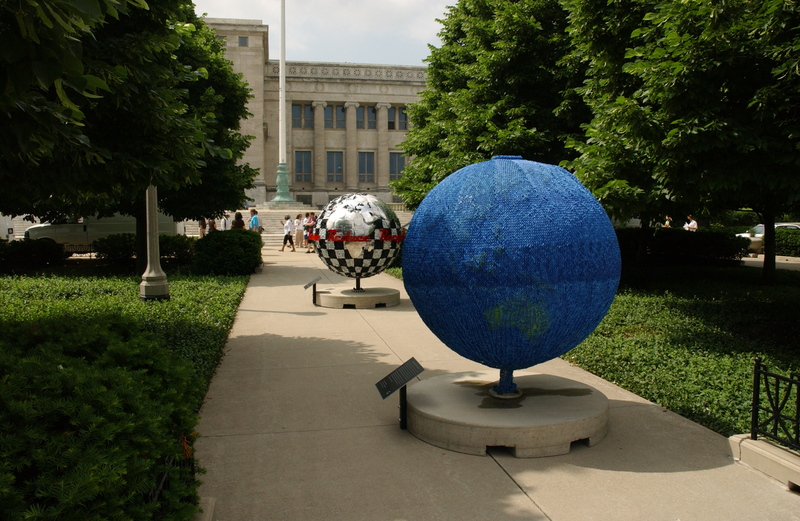 Cheryl Steiger’s globe displays the concentration of cars relative to each continent’s population, and explores how different models of cars compare to one another. With an emphasis on the simple measures that individuals can take, Steiger sends the message that drivers can make a positive impact by getting the most out of their vehicle’s seating capacity in the daily commute. 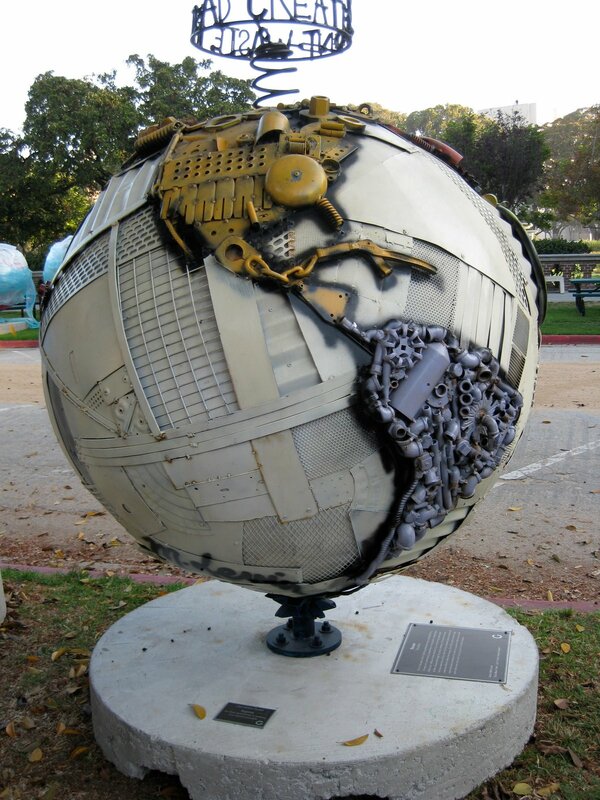 What if we were to cover the globe with garbage? Sound like a ridiculous concept? But in essence that is what we are doing, filling our landfills with waste, raw materials and an abundance of useable objects. Why not strive for “Zero” waste, only buy or manufacture products that can be recycled completely, or reused. Also reduce our trash by not over packaging and truly separating all our garbage. 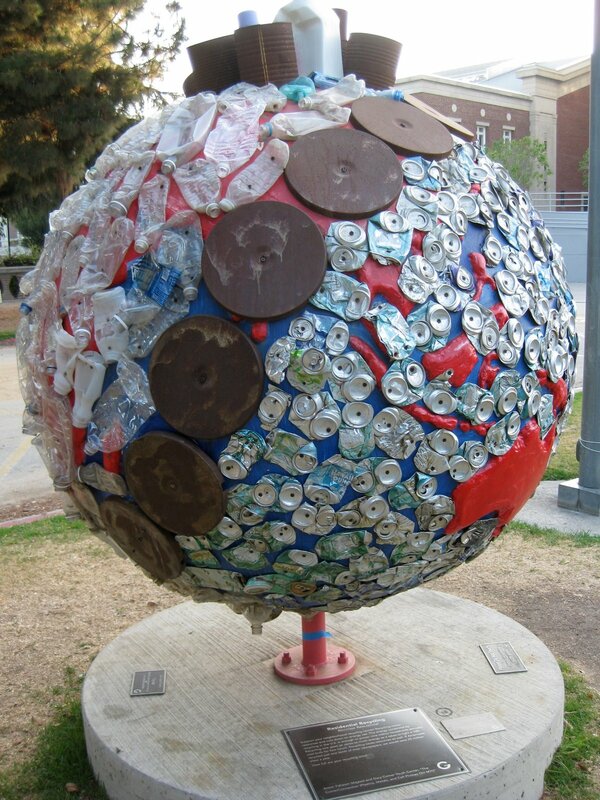 My globe, “Reduce, Reuse, Recycle”, represents these ideas. The water surface was covered with the bottoms of over 1000 aluminum cans, and I reused over 100 HDPE #2 containers to cover the continents in a farmland-like pattern. So don’t Waste, Instead Create, and lets think about solutions and new ways to, reduce our garbage , reuse our products and recycle these precious raw materials. 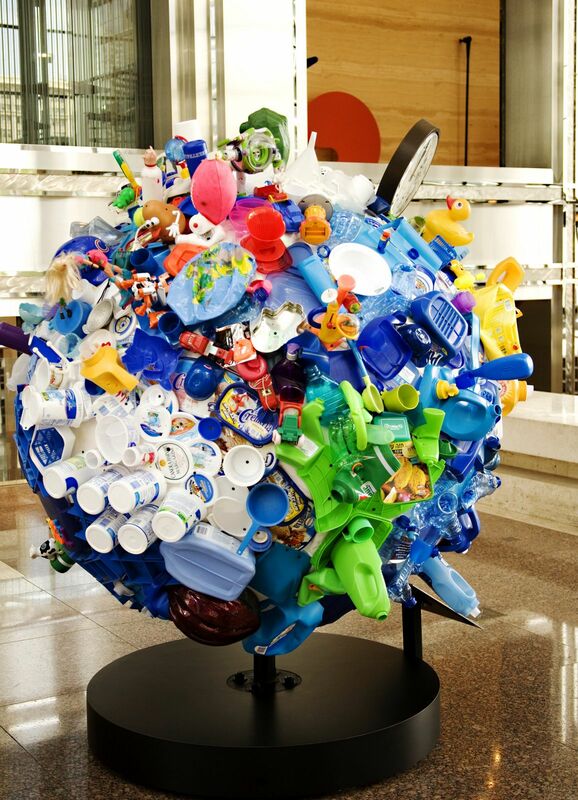 Title: One Man’s Trash…Don’t Waste — Instead Create! 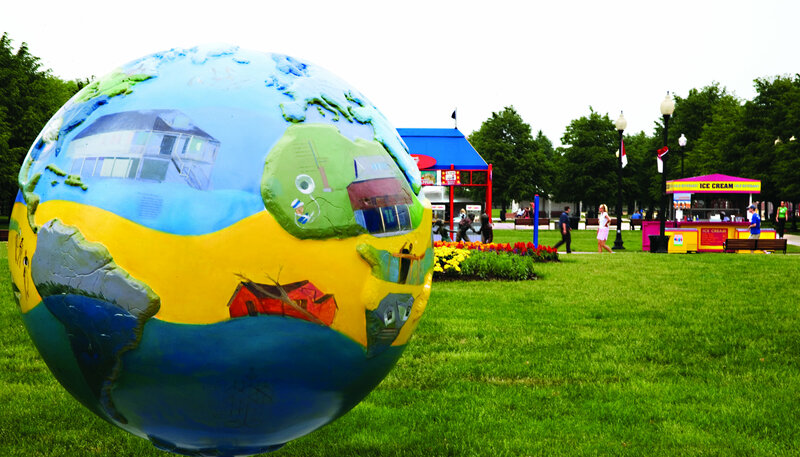 This globe designed by students at Sidwell Friends School depicts a factory of solutions. Each small ribbon tied around the smoke is representative of one factory utilizing a new solution. The solutions are as vast and diverse as the geographic locations they span, from solar, wind and geothermal power to increasing energy efficiency and using resources more wisely. 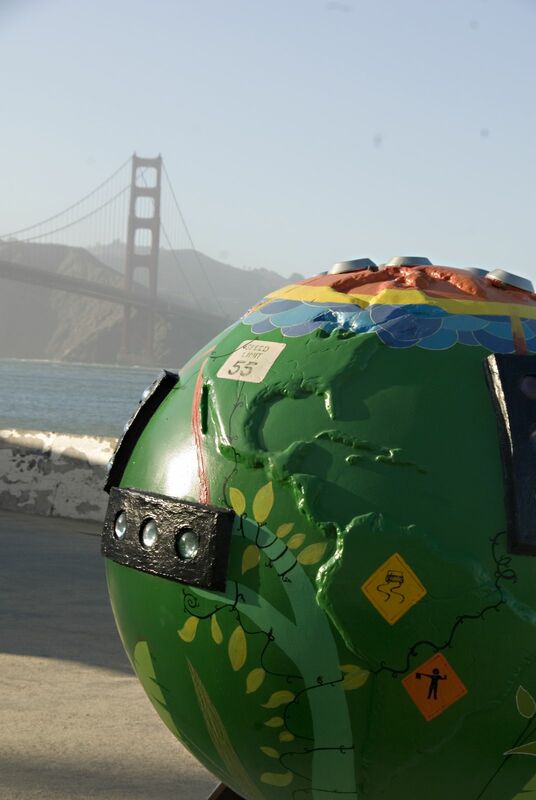 The big ribbon tied around the entire globe represents all the small solutions coming together and giving the gift of clean air and healthy environment for future generations. 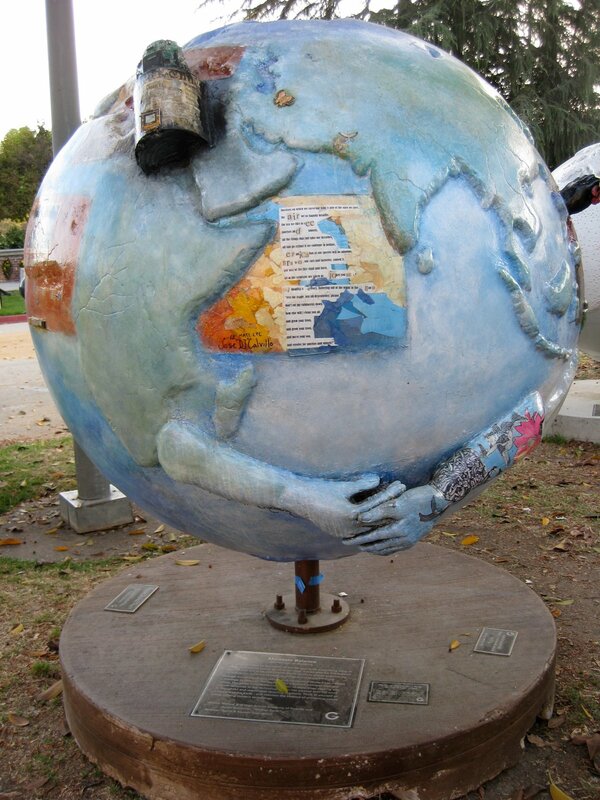 The globe as a whole reminds us that it is through each community doing their part that we will stop global warming. A new U.N. report says that nearly half of the water and 80 percent of the agricultural land in the United States are used to raise animals for food. Livestock production is also responsible for almost a fifth of global warming emissions – that’s more greenhouse gas than is released from all of the world’s transportation combined! You can make a difference with a greener diet. Avoiding meat just once per week can help. It takes far more fossil fuel energy to generate the same amount of protein from a meat source than from a plant source. Try dishes made with beans, grains, and vegetables. Choose grass-fed, freerange, organic, and locally or sustainably farmed products whenever possible. What warms the globe as it runs down the drain? The 350 gallons of water that an average American family uses every day. Power plants emitting greenhouse gases go to work every time someone turns on the tap, using electricity to extract, transport, purify, and distribute water. Heating water creates even more globe-warming pollution, with up to 25 percent of a home’s energy used to fuel its hot water heater. To illustrate the importance of water conservation, Mirjana Ugrinov installed a variety of nickel-plated, brass water-saving faucets and handles around her globe. While the fixtures function as decorative elements, their real purpose is to make the viewer think of their own simple ways to conserve, like choosing narrow nozzles. Ugrinov clustered handles over regions that use the most hot and purified water to convey that every drop counts. Save the headache of commuting and work from home! If the 32 million Americans who could telecommute worked from home just once per week, over a billion pounds of carbon pollutants would be saved each year. 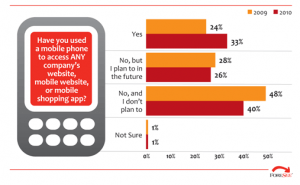 Teleworking is the new concept that allows people to work from anywhere. 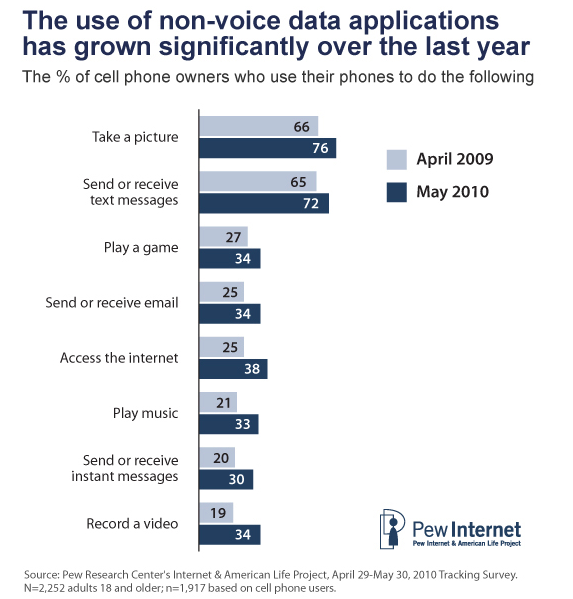 Modern communication techniques such as instant messaging, video conferencing, and online virtual meetings provide the real-time communication we need without the CO2 emissions from our cars. 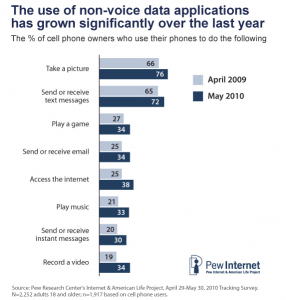 Telecommuting and teleworking are good for the bottom line as well. Companies that have implemented telecommuting and teleworking programs have seen productivity go up, making it a win-win-win proposition for employee, employer, and planet! Can you do the job from home? Humans have been harnessing the power of the wind for thousands of years. 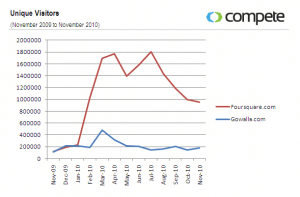 But now, on a much broader scale, wind is an increasingly valuable source of renewable energy. In fact, experts believe that the United States could ultimately harvest 20 percent of its electricity from wind power. It’s not just a cool breeze–it’s a great source of power! Lisa Fedich teamed up with hospitalized children from Snow City Arts to depict how using wind and solar power can dramatically reduce our carbon emissions. Painted as a blustery day for the world, the globe contains excerpts of children’s poetry reflecting their interpretation of the power of wind. 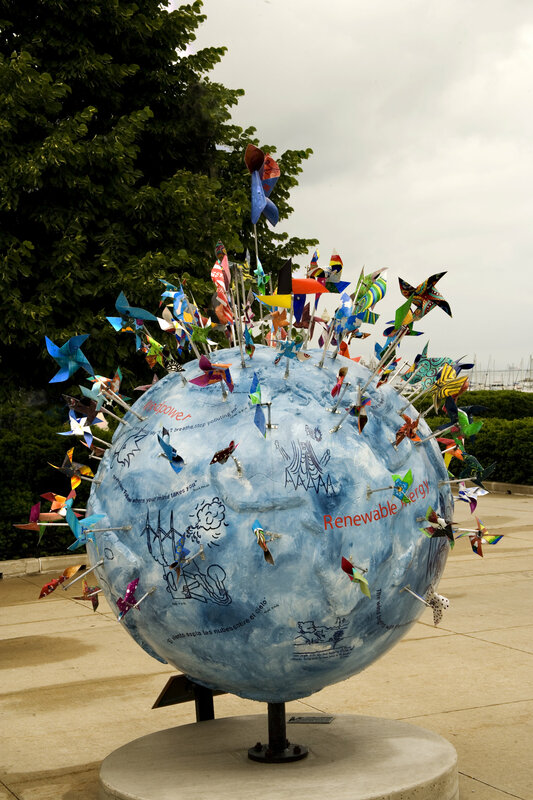 Whimsical pinwheels spin around the globe, inspiring viewers of all ages to dream big when it comes to wind. It’s versatile, readily available, and an easily renewable source of energy. Wind power is the fastest growing source of electricity in the world, with an annual growth rate of 30 percent. In fact, wind farms are popping up all over the country, as customers demand cleaner energy and policymakers create new incentives for utility companies to make green energy widely available. 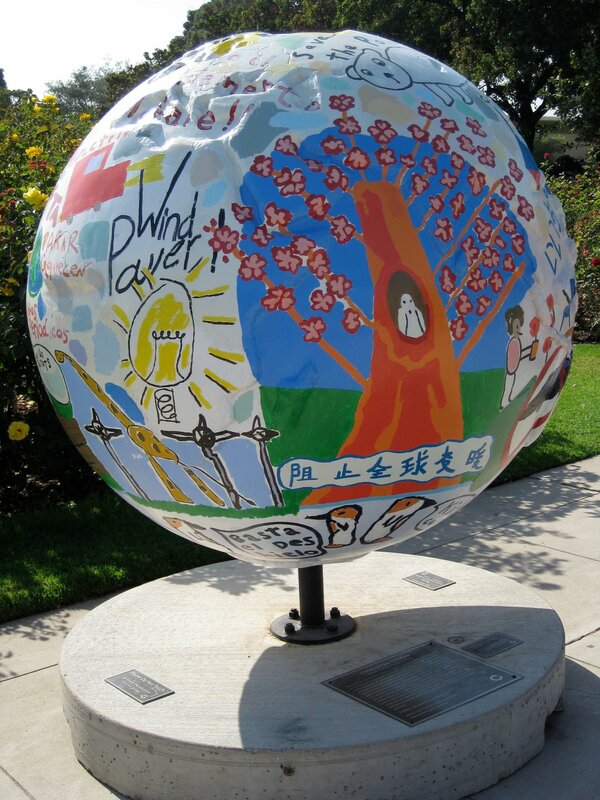 This globe represents wind movement and flow over the earth’s surface, designed by Karen Ami to show how readily accessible wind power really is. By using ceramic and vitreous glass tiles, Ami contrasts land and water through a variety of textual patterns. 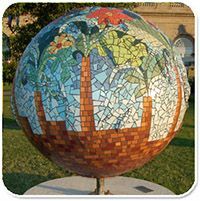 The mosaic creates a visually unified whole that serves as a metaphor for the unity necessary in the fight to stop global warming. Global warming must become part of this culture’s consciousness. Al Gore has been nominated for the Nobel peace prize for drawing the world’s attention to the dangers of global warming. His efforts to spread the word about climate change in the Oscar winning documentary, an Inconvenient Truth have reached millions of people. At the climate project, a thousand lecturers are being trained to present a scientific slide show on global warming to hundreds of thousands more people around the world. 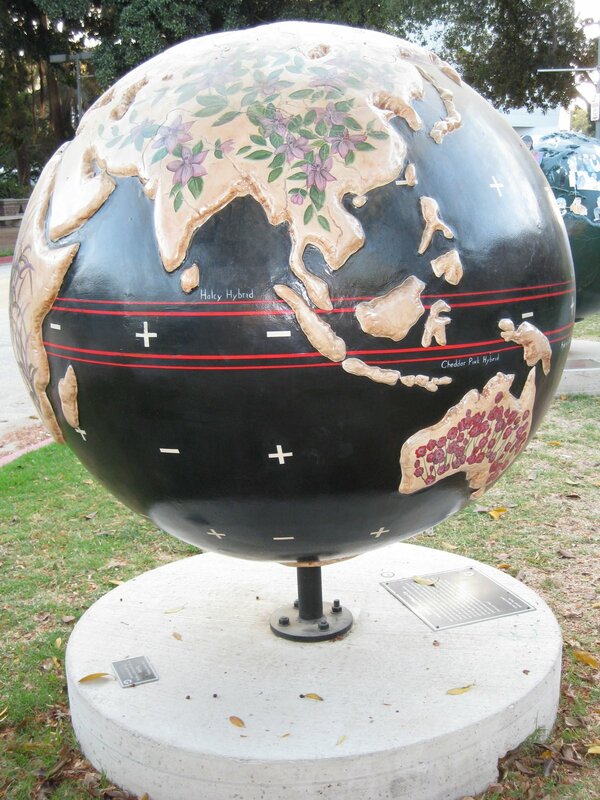 Black lines of communication spread between countries across continents, covering Vance Williams globe with patterns similar to those of an airlines flight paths. 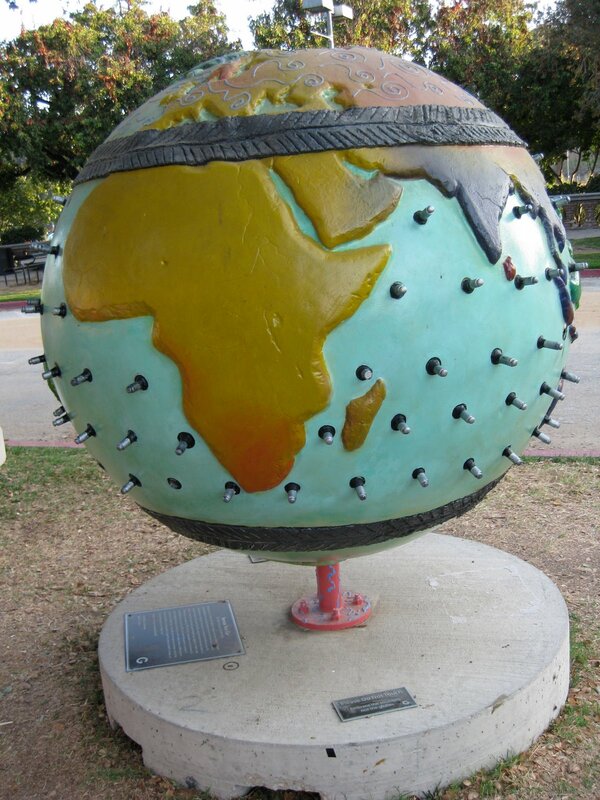 Encircling the center of the globe are photographs of individuals with statements about how you can get involved. 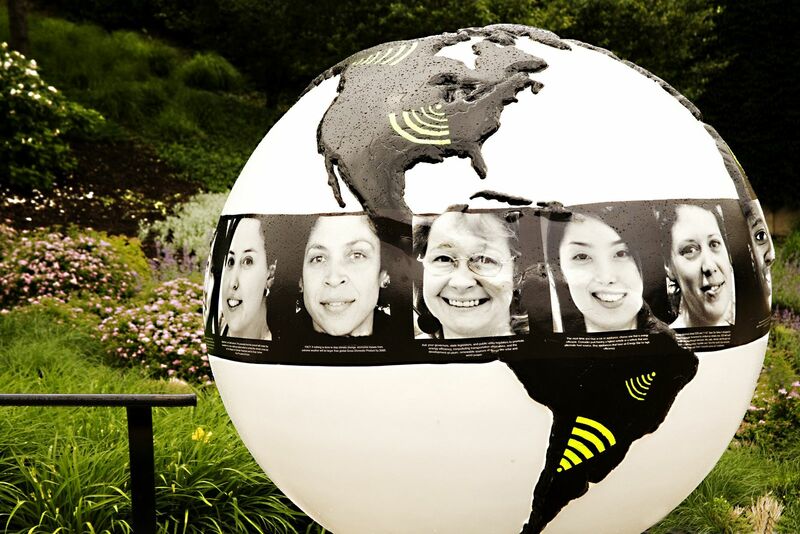 Fluorescent megaphones appear across the continents, enabling all of us to spread the word. One house can be responsible for producing twice as much greenhouse gas as a car. Performing a home energy audit to target lost energy is a good place to start reducing these emissions. Based on the results, people can improve heating and cooling efficiency with caulking, weather stripping, and extra insulation. With an artistic style that ranges from surreal to abstract, Luz Maria Castillo details the process of greening the home by dividing her globe into colorful rooms that each show a solution to global warming. Castillo expresses the many different approaches through various techniques like manipulating the proportions of objects to emphasize their importance. 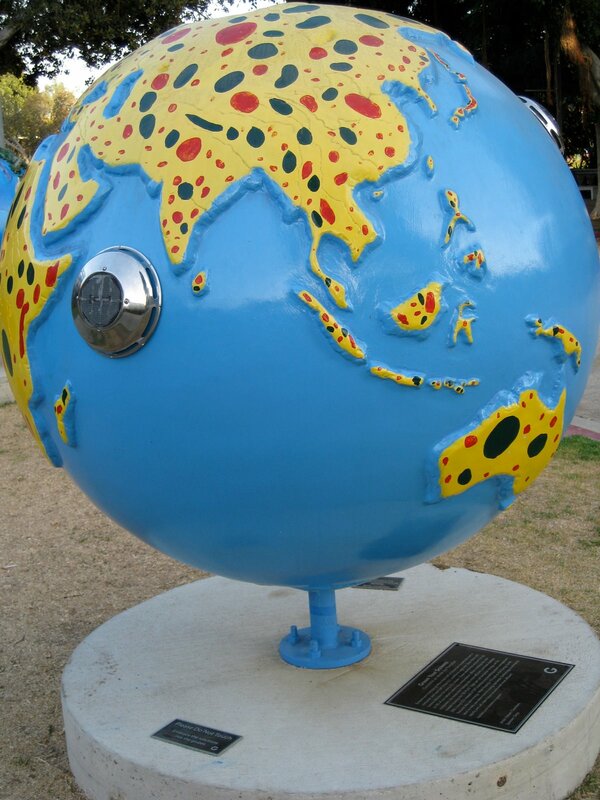 Influenced by the Mexican bingo game, Loteria, Castillo’s globe implies that we are gambling with the earth. Being green doesn’t have to be difficult or expensive. Simple everyday actions can save energy and money. Teeniegreenie.org, a grassroots effort led by concerned citizens, advocates that small changes can make a big difference. Imagine if everyone turned off the water while brushing teeth, shut down computers at night instead of leaving them on and glowing, used manual can openers or bought recycled napkins. These simple steps would add up! The tiny plastic people covering this globe stand for the members of teeniegreenie.org who have committed to sharing these small measures to help make the world greener. 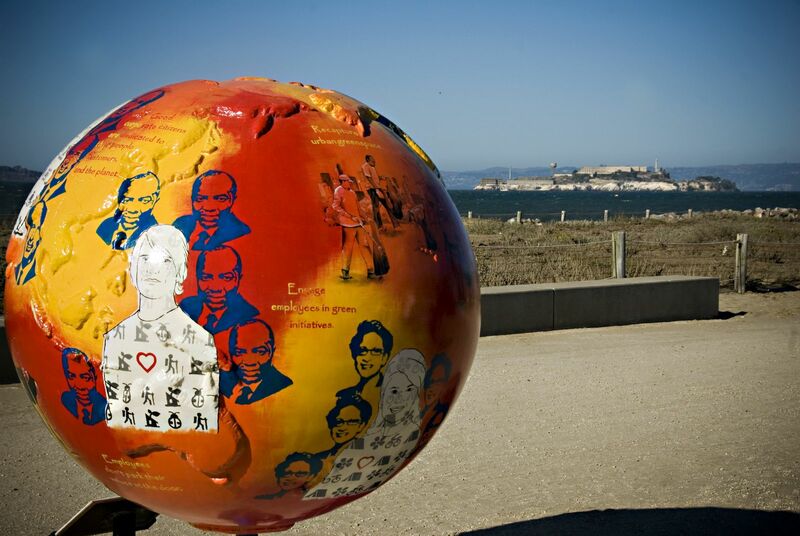 This globe–and the entire movement–prove that we can each take little steps to make a big contribution. Can you green your working environment? Paper is a good place to start. The average American uses nearly 700 pounds of paper a year. To ensure that your paper gets a second chance, put recycling bins in convenient locations. Consider using paperless fax modems for computers and a duplexing copier for double-sided paper. Reuse envelopes for internal circulation, and don’t forget to recycle ink cartridges. Think green before making office purchases. Use products with a longer life, such as low energy light bulbs. Buy recycled paper products. Consider purchasing Energy Star office equipment, which has power management features. Reduce energy consumption by using flat panel LCD screens, laptops, and ink jets. Take care of the equipment you do have. Remember to switch it off or set it to sleep when it is not in use, or even better, unplug it. 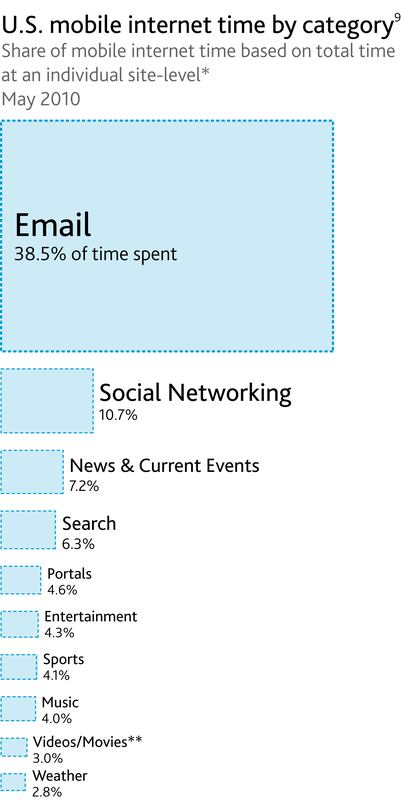 Is helping the environment on your \”to do\” list? The times they are a-changin’ again. Like the civil rights marches and anti-war demonstrations of the 1960s, the movement for clean energy is mobilizing high school and college students today. Youth activists are rallying to eliminate schools’ carbon emissions and to influence legislators to clean up America’s energy policy. Groups on nearly 600 American and Canadian campuses have joined the Campus Climate Challenge, aimed at bringing sustainable energy to their schools. Young environmentalists are demanding action through demonstrations, blogs, online videos, and meetings with administrators and legislators. In Vermont, Middlebury College students persuaded trustees to invest $11 million in a power plant run by wood chips. Students at the University of California, Santa Cruz voted to pay a fee to buy 100% renewable energy. 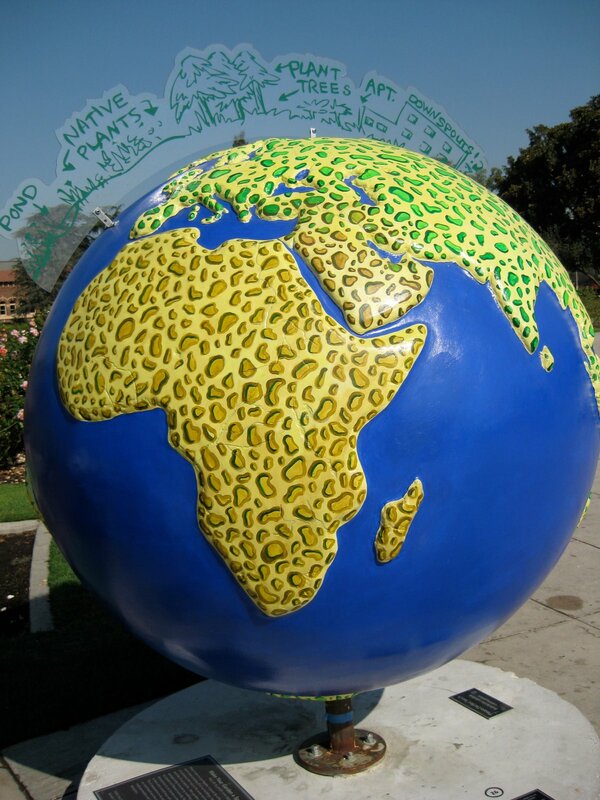 Campuses are going green, and students want you to follow. 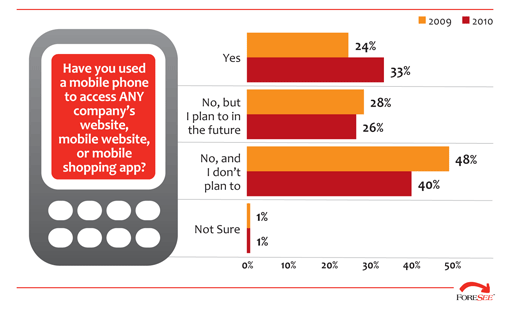 Can you hear Generation Y calling? 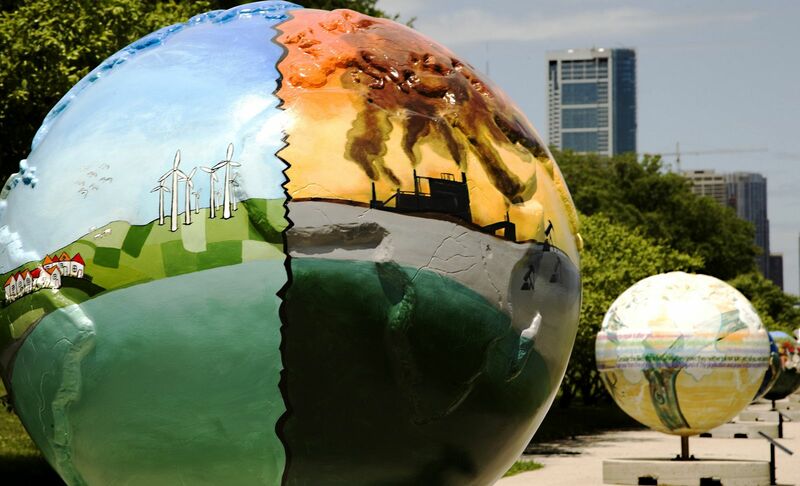 Title: Everyone is Talking About Global Warming: Are You Listening? In the old days, folks warmed up by putting on a sweater or cozying up to a crackling fire. Common sense solutions like these are good choices again in the fight against global warming. Half the energy used in your home runs your heating and cooling systems. You can curb greenhouse gas by simply adjusting your thermostat. Try setting the temperature at 68o or lower in the winter and 78o or higher in the summer. Programmable thermostats let you regulate temperature to conserve energy when you are asleep or away. Don\’t be afraid to ask restaurant, theater, or office managers to turn down the air conditioning. Commercial buildings consume about one sixth of all energy used in the Western world, and up to one third of that is for air conditioning. You shouldn\’t need a sweater when it\’s 80o outside! Where do you set your thermostat? 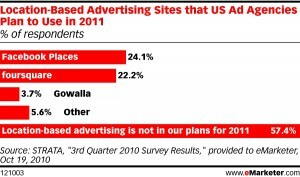 \”Turn off that TV!\” What parents haven’t made that demand to protect their children’s mental and physical well-being? As it turns out, the planet’s health is also affected by too much television. Americans use more than $5 billion worth of electricity annually to power TVs. Energy that creates greenhouse gas runs the television, DVD, and game console in an average American home eight hours a day! Save energy and strengthen your family by taking part in community TV Tune Out Weeks, periods when towns offer special alternative activities. Or start your own campaign to turn off the tube. Enjoy non-electronic play, such as board games, cooking, reading, craft projects, and sports. When you turn off the television, your kids will get more exercise and become more creative while you reduce global warming pollution. 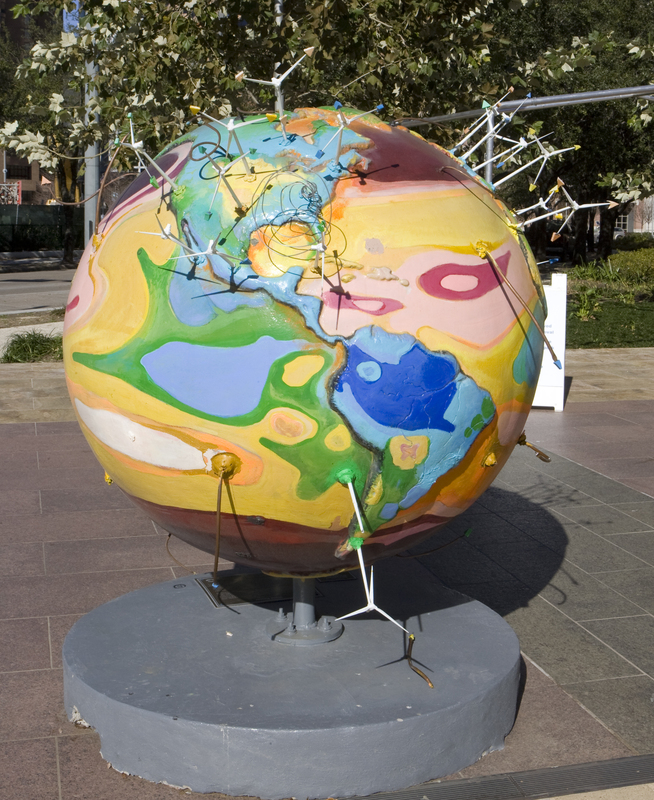 This globe depicts one of the planets most rapidly developing sources of energy. While the major consumer of electrical power, the United States is now the leading producer of wind generated power having surpassed Germany. Wind farms are on the increase in North Texas, California, the Midwest, Northwest and the East coasts of America. The next frontier will be capturing the naturally occurring high wind currents located just offshore. The wind turbines are increasing both in size and efficiency due to new increases in technology. 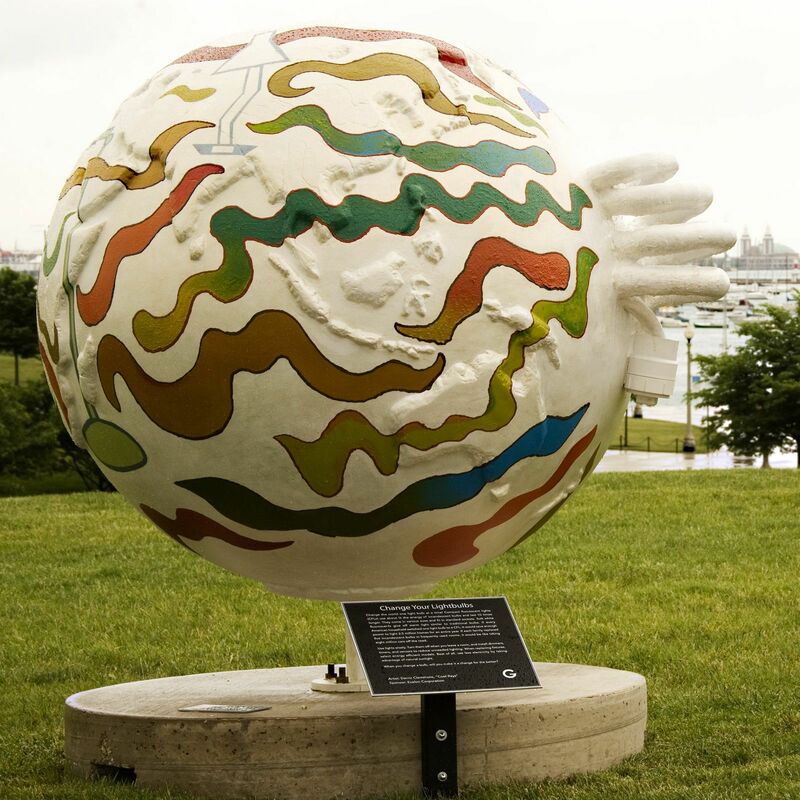 Kopriva’s art depicts the average major wind velocities constantly covering our planet’s surface. The abstract appearance of the colors represent a speed wind ranges of very high ( red) to very low (blue) scattered over the globe’s surface. Note that major sources of wind are located in difficult to harness high winds occurring in our southern latitudes ocean areas. Significant trade winds are represented by pieces of directionally curved copper tubing. These winds have been known to sailors for centuries for their consistency. Locations of major existing or new locations of wind farms are symbolized by actual replicas of modern giant wind turbines. The viewer is reminded of the ever fickle nature of our weather by epitomizing symbols of tornados, hurricanes, cyclones, and typhoons. Americans may not agree on which candidate to vote for, but many agree that the environment’s welfare must be part of the national agenda. 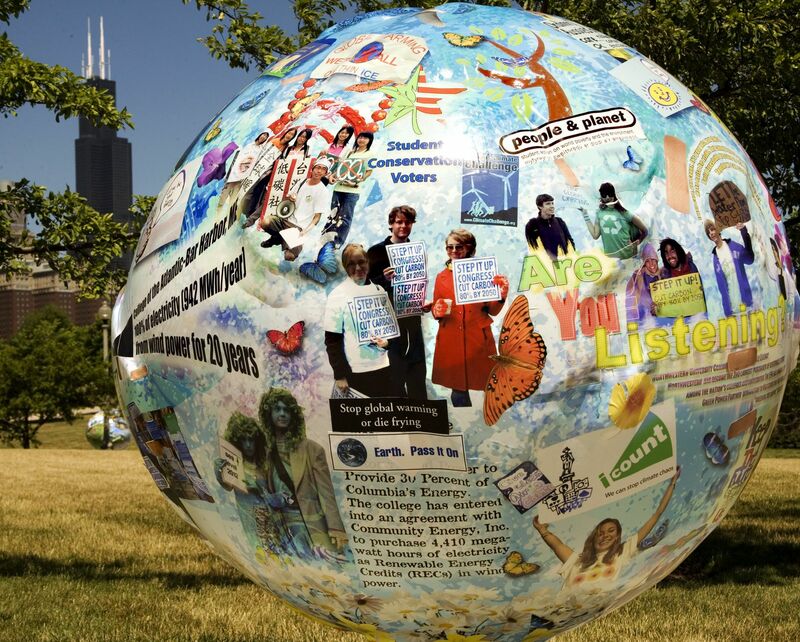 Elected officials are working across party lines to find solutions to global warming. Last year, a bipartisan coalition of U.S. senators introduced legislation that would reduce gasoline consumption by a trillion gallons over the next 20 years. Peter Mars has long been a leader in Chicago’s \”avant pop\” movement. 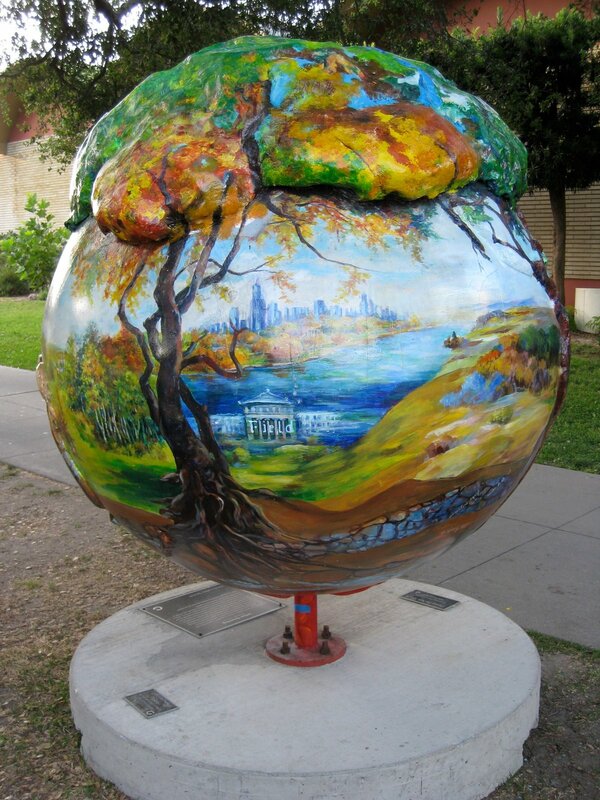 Combining found objects with images from popular media, Mars painted his globe to tell a poignant tale of the creatures who are most immediately affected by global warming: the polar bears. 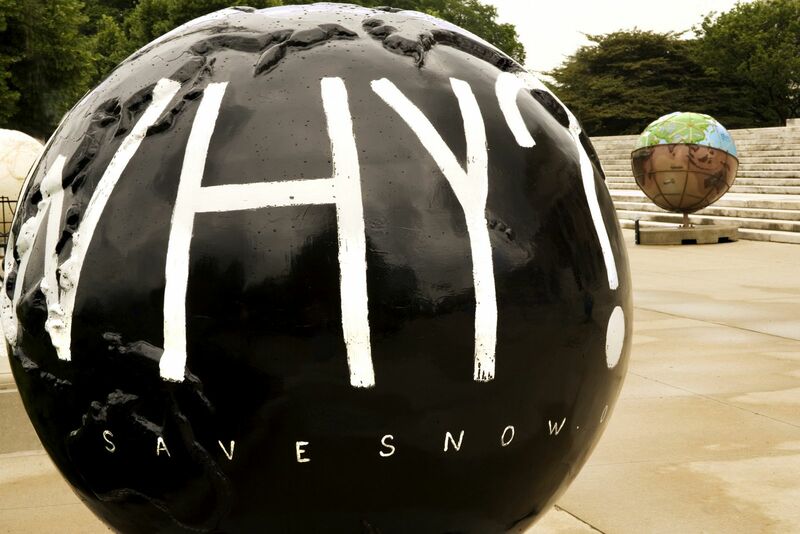 The patriotic globe shows a concerned polar bear father visiting the U.S. Capitol to try to convince senators and representatives to help him save the rapidly receding polar ice. Organic farmers save energy! The production of petroleum-based fertilizers and pesticides accounts for 36% of agriculture energy use. Natural farming methods avoid these synthetic products and therefore help reduce greenhouse gas emissions. Approximately 75 million acres worldwide are now farmed organically. Today, more and more organic products are available at specialty stores and your local supermarket. You can also find appealing organic fruits and vegetables at your neighborhood farmers’ market. 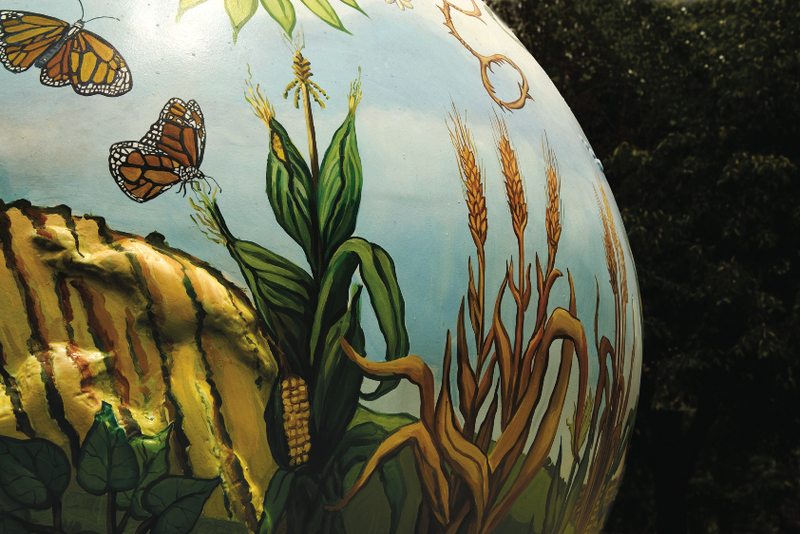 Some local farms offer programs for weekly deliveries of organic products. Put organic foods on the top of your shopping list! Aim for clean air along with clean clothes! Doing laundry may be unavoidable, but you can avoid excessive energy use on wash day. First, don\’t bother doing laundry until you have a full load. Then, adjust the dials. As much as 90% of the power used by your washing machine heats the water. Use half as much energy just by switching from hot to warm water. By setting the rinse cycle on cold, you use even less energy, and clothes get just as clean. Your dryer uses more energy than any other home appliance except the refrigerator. Use your dryer\’s moisture sensor and avoid overdrying. Remember to clean your lint trap after each use for better air circulation. Hang partially dried clothes, or skip the dryer altogether and line dry. When buying a new washer and dryer, choose high-efficiency models. Are you caring for the earth while caring for your clothes? Over 600,000 people are marching online to stop global warming! Are you one of them? The organization StopGlobalWarming.org has banded together people with the common goal of finding solutions to climate change. The website was created by activist Laurie David to mobilize individuals with environmental concerns. The virtual march has successfully built a front against global warming and been strengthened by celebrities, politicians, and corporations lending their support to the cause. Go to StopGlobalWarming.org and join the march! 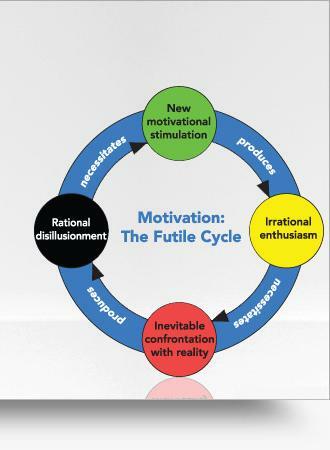 Motivation: Psychologists tell us that it can only come from within. Common sense tells us it can’t be manufactured. So how is it that a multi-billion dollar industry thrives through the sale of “motivational” products and services? Because in our shallow times, people desperately want to believe there are simple solutions to even the most complex of problems. 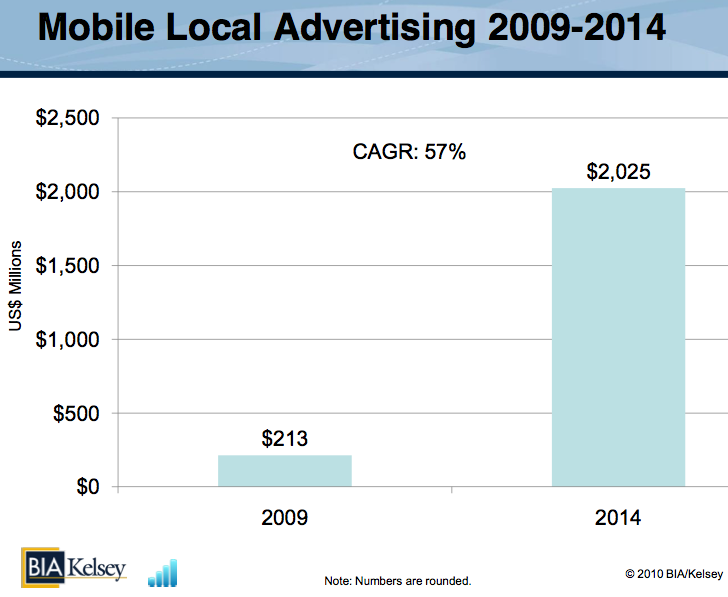 And when desperation has disposable income, market opportunities abound. 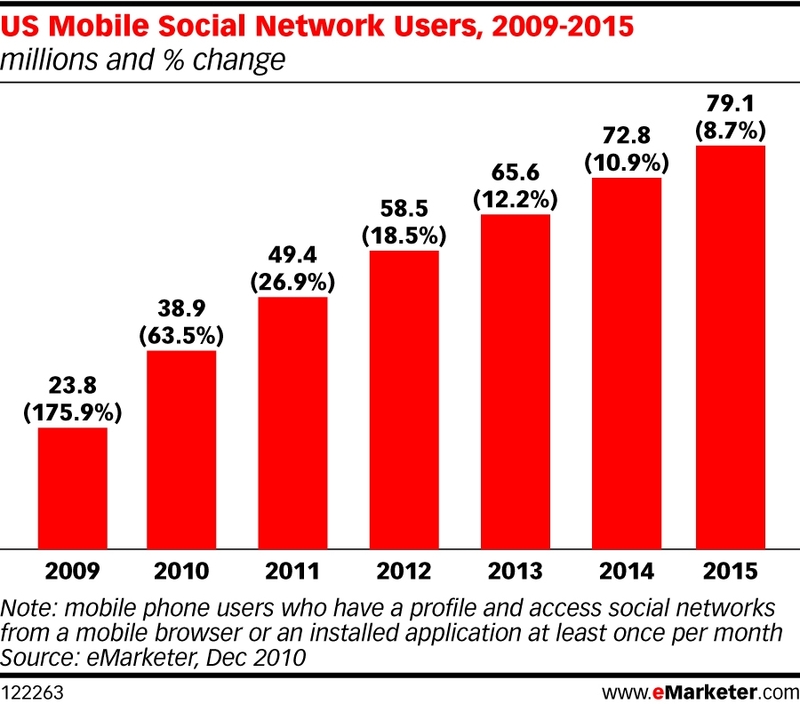 Lately, I’ve been interacting more regularly on some key social platforms. What I’ve noticed is that there is a lot of anxiety, confusion, and yearning for answers as to how to become more influential across the social interweb. And the above mentioned forums are excellent resources for sharing and communicating implementation strategies and tool usage. So major props to the hosts of those forums/communities. 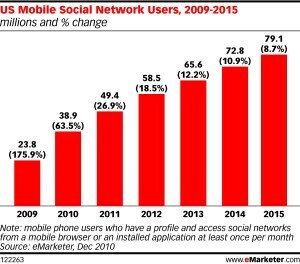 With social platforms like Facebook, Twitter, LinkedIn and Youtube massively changing the way businesses interact with their market, the future of business IS SOCIAL, there will not be an option. Those choosing to stay out of it will disappear. Because Trust and Credibility, accompanied by top of mind awareness will win customers every time over a marketing message. 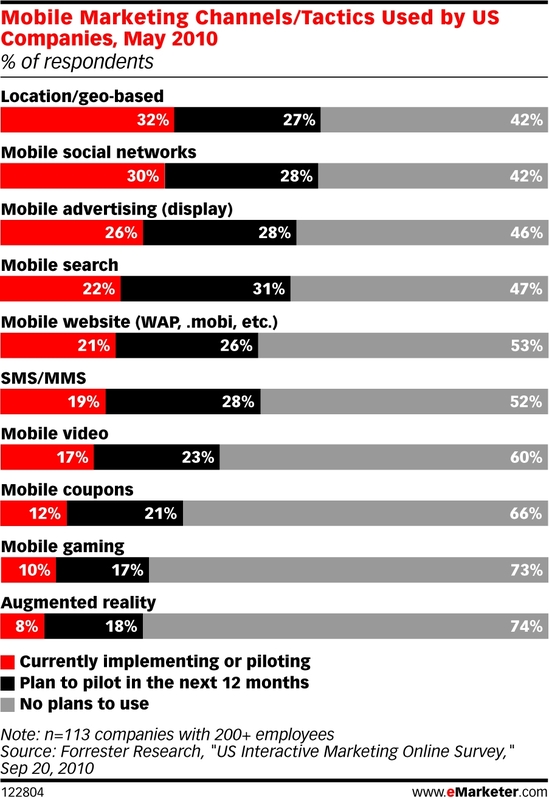 Social is built on these foundations of buying decisions. 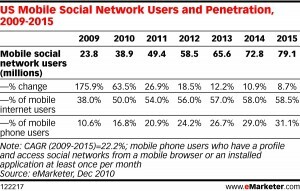 With the advent of Google Plus and other technologies Facebook is working on, social influence will begin to dominate search criteria as well in a very short period of time. So companies that have social influence will have a serious competitive advantage over those still trying to figure it out. These upcoming changes are not commonly known, however they are already happening and beginning to impact buying decisions today! 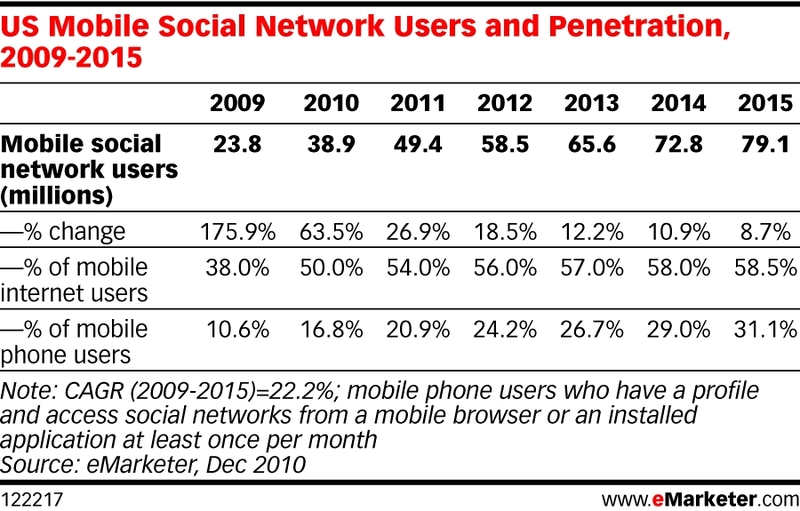 How does one calculate social media influence? 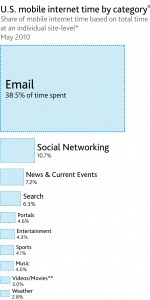 How does one find “influencers” in categories like publishing? 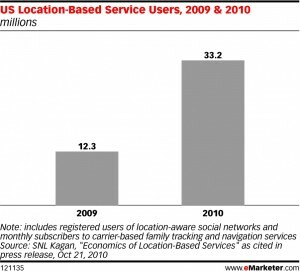 Influence is currency, and the unprecedented rise of social media has generated a need to evaluate that influence. What are influencers saying about my brand? How many of my Twitter followers are clicking through my links and retweeting my content? How can we increase those numbers? 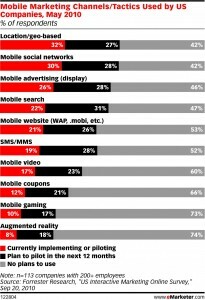 But most importantly, publishers want to know what is the “true reach” of their organization? These are the questions to ponder about……….